I hadn’t meant to disappear on you, and what’s worse, I have a terrible excuse: I took a nap. In the same week that I conquered my cooking Mount Everest — a lasagna I’d only dreamed about for the better part of six years, one that still took me many tries in the kitchen to get right and more than a week just to write — I was going back and forth with my publisher over the page designs for my cookbook, and (no doubt) giving some poor book designer some gray hairs. One day, I’ll remind my editor about that time I said that I didn’t care how the book looked, “just make it pretty!” and she’ll snort coffee out her nose. It will probably be a while. Nevertheless, the day after I posted the lasagna recipe, we finally found something that made everyone happy and now they’re designing the remaining hundreds of pages and that night, I think I slept a million hours. I did the same thing the next night and on the third night, when I yawned at 9 p.m. and said I was thinking about calling it a night my husband — who is the one who typically has a bottomless capacity for sleep and I’m the one who pops up at 7:30 even when it’s my turn to sleep in — looked at me like I had two heads. I… just had a lot of catching up to do. We’re also officially in the part of the year I affectionately call The Dregs of Winter. It’s not spring yet, in fact, it will at least a month before anything tasty or green emerges from the earth and another month after that before they will be good enough to eat. It’s not actually snowy and pretty enough out there to bliss out in a New York Winter Wonderland; in fact, it’s just cold and a little dull. Typically, the way I get through the blahs of winter is not to sleep through them but to begin plotting an escape. I start pining for someplace tropical, please, where the deep blue ocean meets the bright blue sky at a horizon so far away, it’s almost unfathomable to this city dweller, whose current vista is little more than the building across the street. And so I think about it, think long and hard about it, a book open on my lap, my fingers wrapped around a frosty, fruity cocktail with an umbrella and then I fly home a few days later, my usual ghost-like complexion faintly less so and my brain cleared of thoughts that don’t include “Is it time to reapply?” and “Are we too old to go on the water slide that leads to a swim-up bar?” You know, weighty matters. Alas, this daydream of a trip is still two very long weeks away, so I sublimated my wanderlust, as I always do, in baked goods. I cannot will warm weather here or myself to warm weather sooner but I can make a breakfast muffin with the suggestion of a place with no winter. I still stuck to my muffin rules — muffins are breakfast food, not just cake, though I have yet to convince this guy — so it includes a good helping of whole wheat flour, lots of good yogurt. And then I supplied the coconut two ways, one with shredded coconut and the other with a relatively new-to-me ingredient, coconut oil. Coconut oil is wonderful, but you probably don’t need me to tell you that. Besides having a lightness to it that comes from fats that are solid at room temperature (think: shortening, but with a heavenly flavor), it imbues each crumb with a dreamy whiff of coconut. The resulting muffin is dense but light and impossibly moist and will, I hope, be an effective temporary stand-in for the warm weather to come. Although these are a fine muffin, fragrant with coconut and filled with a dense, moist crumb as written below, the potential for adaptation is almost endless. First, you could make them triple coconut muffins (and dairy free) by using coconut milk instead of yogurt, but I do like the texture that the tangy yogurt imparts and these muffins have no lack of coconut flavor. You could make mango-coconut muffins by adding a cup or so of diced mango chunks to the batter; pina colada muffins would use the same volume of pineapple chunks. You could replace the yogurt with mashed banana or banana puree to make a banana-coconut muffin and if you’re into that whole lime-in-the-coconut thing, you could add a teaspoon of lime zest. Chocolate chips? (1 cup), Macadamia nuts? (1/2 to 3/4 cup, toasted and chopped)… Really, I’m just getting started. If your yogurt and egg are not at room temperature, they will re-solidify the coconut oil, which is fine for baking but makes the batter quite thick and difficult to stir, like a cookie batter. (Uh, see my photos above.) But, it all works out. It’s much easier, however, if you let the ingredients warm up. Yield: 10 standard muffins, though this seems off to me and I suspect that some of you will tell me you made a dozen (as I’d expected to). In a small saucepan, warm your coconut oil just until it melts. It should still be on the cool side. Do ahead: Usually, muffins are best on day one but I just had one of these on day three and found them almost as moist and tender as day one. Store in an airtight container at room temperature. I actually find March to be the worst month food-wise. No good root veggies left, maybe an errant parsnip, but then April comes and everything is luscious and green. But I’m not going to argue with these muffin offerings. No siree. I have to make these right away… it’s like a macaroon in muffin form! How brilliant! These look delicious! And I love that they only make 10! I love you because you can seemingly read my mind even when I cannot. These are exactly what I have been craving, and I may just have to make them tonight. I made something very similar for a dinner part last weekend. I drizzled some caramel sauce over it as well. Everyone wanted the recipe! Ooh, these sound great. I need to figure out a way to adapt them using coconut flour, we are on a grain free diet. We’ve baked a few muffin recipes (pumpkin and blueberry) with coconut flour and my family *loves* them, but none of them taste coconutty. Thanks for the recipe ideas! My husbands favorite cake is coconut cake so these muffins would make him a happy guy. I love that these are a healthier version of coconut cake and I would actually feel good about eating these. My kids are off this week, so I think we may just have to bake a batch of these muffins up and surprise the big guy when he comes home from work! I love all things coconut and just happen to have all of these ingredients on hand. Yum. I’m also home sick with a cold today….I think I’ve found my afternoon project! would it be lame to somehow dye the coconut on top green and serve these on easter?!!? that is what i thought of immediately! I wonder if I can substitite the Liberty Coconut Yoghurt for the triple whammy!!! These muffins look absolutely delightful. I love a good coconut cake, but these will be a more guilt free! These smell like holiday. Seriously. My only problem is, I don’t know which version to start from, from the many you mention. Always makes my spidey senses tingle when this sort of thing happens. Just the other day, in fact, a week ago today, I saw tubs of coconut oil sitting in the oil section. They’ve never had coconut oil before, it’s a new product to the shelves (I got frantically giddy ’cause any new product is welcome here in Ireland where choice & range is not what I’m used to back home in South Africa). I didn’t actually buy any ’cause at the time I didn’t think I’d know what to do with it. And now, a week later, here I see your recipe requiring coconut oil. And now I know just where to get some too! Coconut oil is basically my favorite thing on the planet… moreso for face moisturizing and hair conditioning than it’s intended use of cooking, but thumbs up to it being used for all sorts of things! I will have to make these. I will use coconut milk, because one of my friends is lactose intolerant. And I will include lime, because it is one of my favorite flavors! Oh these look so tasty! Just a couple tips on coconut oil 1) if you have a cold apartment and use a metal bowl at room temp, add the other wet ingredients and then the oil, otherwise it may resolidify; and 2) coconut oil is the best oil for making popcorn on a stove top; the really high smoke point means the oil gets nice and hot without the smoke, funky taste, or sticky residue that other oils can get when you take them over their smoke point. Plus, the slight hint of coconut in the popcorn is just lovely. Well this certainly does bring summer into the wintery kitchen! The pina colada variation sounds tempting. I wonder if rum could be added? You deserve the naps! :) These look lovely. I haven’t made muffins in a while and so these might just be included in my to-do list soon! Awesome. I love coconut, and I’m a big fan of using yogurt in things. Props. All of the coconut in these sounds so delicious! I’d love to try them with some zested lime for an even more tropical taste. I cannot wait for some sunny, summer weather to match the beachy feel of these muffins! You are an evil temptress, and I like it! We’ll be making these very soon, but I doubt there will be any left to try after 3 days! I call it shoulder season on the PNW. I don’t enjoy much of it at all and also dream of tropical venues and then go to said locals. The muffins, like so many of your other muffins look spot on! Just on a hunt this morning to use up a great deal of Greek yogurt… I will make these tonight! Yum. Yeah to being back. Will try these this weekend. 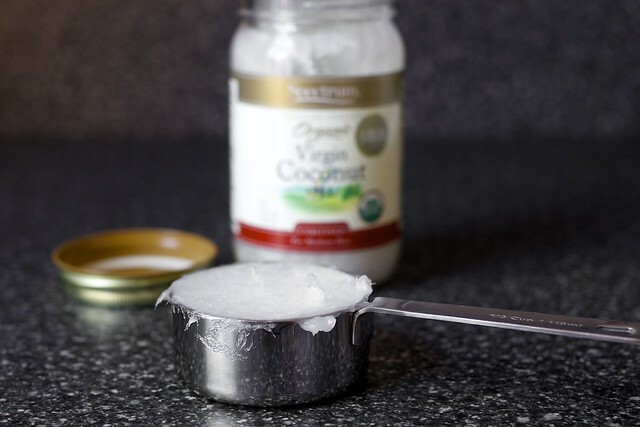 I enjoy coconut anything and I have been using more virgin coconut oil in some of my baking and cooking. These look delicious. The timing on this recipe is surprisingly perfect. I made myself the pina colada cake for my birthday last week, which was *amazing*, and have left over shredded coconut (that I used to top it). Also ran out of paper liners in the process… But, you should know, it’s a balmy 55 degrees in Boston today– practically spring! Muffins are one of my most favourite things in the whole world and who can resist a burst of tropical sunshine in their lives? These muffins are absolutely lovely! I have a jar of coconut oil I bought months ago, just staring at me from the pantry. Maybe I’ll finally break it out and give it a try. Does it still count as breakfast food if I add rum? And to think these appear just as I gave up bread for lent. They look delicious, and I can’t wait to try them in six weeks! Aha! A socially acceptable way to eat coconut macaroons for breakfast! Gale — Hahah. No. I meant that I would wake up at 7:30 when it’s not my morning, as in, his father was already up with him. Wow! These look incredible. LOVE coconut in general, but the oil takes it to the top. Thanks for sharing! Yum! Banana-coconut sounds right up my alley. What are you using for muffin wraps? They look just like a muffin I bought last week — can’t wait to try making them! I just grabbed a jar of coconut oil from Trader Joes last week because I knew this was a trend for a reason. This looks like something I have to make immediately. I am a huuuuge coconut fan, so I am totally making these. I haven’t experimented with coconut oil yet, but it seems like it would be tasty. How do these rate on the Alex coconut-o-meter? My husband doesn’t ‘do’ coconut because of the texture but he quite likes the taste. I’m wondering if I could get away with these. And how did you know I have half a jar of coconut oil that needs using? this is making my slightly giddy. I am doing this health challenge competition which includes no sweets/dessert/etc. Muffins are, as you say, breakfast food! So I will feel totally justified in eating these. I may cry while I do so, because it’s been 7+ weeks of this challenge, and I am feeling seriously deprived. I adore coconut and these look delicious. Thank you! I think I’ll try and add cherries to them, maybe a cup of chopped cherries? Any chance of weights in grams and millilitres? Thanks! ugh, too bad my bf is allergic to all things coconut. i shall console myself with the knowledge that today is National Margarita Day instead! I feel your sentiments… I grew up in a tropical country and after moving here, dreary winter days make me feel so homesick and long for shorts, tank tops, and flip flops. 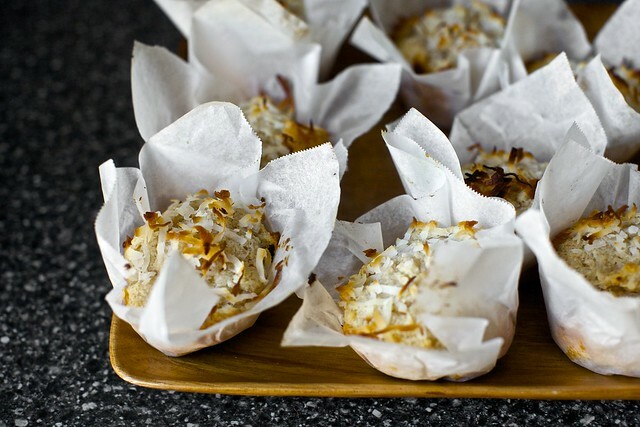 These coconut muffins are beautiful and heart warming. I have a bag of whole wheat PASTRY flour at home. Will that work? Yes, what *are* those muffin papers? Parchment paper? Looks very nice, but is it hard to not mess up the white tips with bits of batter? Deb, the second sentence in the Dregs of Winter paragraph needs some fixin (3). Also the second sentence in the Alas, this… paragraph. This look amazing and I just happen to be going to the “big” grocery store today that has coconut oil and was planning on getting some to try. Do you think almond flour could be used instead of the regular flour? Add some pineapple and it would be like eating cake for breakfast. Where are the winter slaws? I just added coconut oil and greek yogurt to my grocery list. I love coconut oil, but its still pretty new to me too. I open the jar and I just want to eat it with a spoon. Clearly my love of coconut knows no bounds. And I am sooo glad you called for sweetened shredded coconut. It seems like all the coconut recipes I’ve been seeing lately call for the unsweetened stuff and the only store I know that carries it is 20 minutes away with the world’s worst parking lot. This is just what I needed to pick up my spirits this dull, dreary day. Brilliant! Can’t wait to try these, most likely with some of those suggested add-in’s. The winter blah is super boring up here in Boston, where we’ve had practically no snow at all (a big disappointment for my first winter in New England) so I am over it. A question: will these freeze well like other muffins? Since I am cooking for one, I usually freeze my muffins and thaw as needed. If not, could I halve the recipe easily? I could eat these ALL DAY LONG. Yum! Coconut definitely makes the Dredges of Winter feel better, at least for me! I love coconut so the idea of DOUBLE coconut makes me swoon! this looks fantastic. even if i probably wont get around to making it, i agree with jenice it’s still helping me get through hump day! Can one find coconut oil at a regular store? Hooray for coconut! Do you cook with coconut oil for everyday stuff? I’ve been hearing so much about it lately I’d be interested to get your thoughts. Thanks! Cooking with coconut oil — Melissa Clark talks about this a lot in her article, but, in short, the virgin coconut oil that I use here has a low smoking point but the refined stuff is supposed to be better for sautes. However, Melissa didn’t find in her experiments the smoke point of virgin coconut oil to be a problem. That said, I bought this at Whole Foods and there was a whole row of them, some marked for “moderate” heat cooking (like this one) and others for “moderate to high”. It makes sense if you want to saute with it to buy one optimized for higher heats. MN Maya — Thanks for the sharp eye. The paper liners and how to make them are described in full in the recipe. Tasmin — Alex ate and said he liked one. He doesn’t mind the flavor of coconut, hates the shredded dry texture. Nevertheless, these make a small batch and freeze well. No reason to keep yourself from them because of a coconut-resisting spouse! Indeed, it is That Part Of Winter. But what a lovely antidote! I made my favorite whole wheat coconut bread last night, and it is heavenly…but this variation might be the next thing to try! I’m new to coconut oil, but I just might have to try these out so I can see what it’s like. Thanks so much! They look amazing! Kicking myself for not buying coconut oil at the store I JUST returned from. These look fantastic! Here in the Bronx it is sunny and predicted to be in the high 50s today. Crocuses and snow drops are up and I can see signs of tulips and daffodils starting to come up as well. Dregs of winter? not so much. Mmmm. These sounds good about now. I’ve never baked anything with coconut oil, but I’ll have to try these out. I bet coconut oil would be good in many desserts. Hmmm…. Coconut oil is ideal for frying plantains in, too! Try it. These look beyond delicious! I am such a huge coconut fan and a pretty presentation to boot! I don’t have whole wheat flour, can I substitute something else for it? These look delicious otherwise! Thank you for answering my question. While the muffins look absolutely delicious, my attention is totally focused on those homemade muffin tin liners. What a great idea! They make each muffin all the more transportable, what with having a built-in wrapper and all. I love it. Oh good golly! A macaroon muffin! Can not wait to break one of these in half. BTW- I made your tangy brisket AGAIN for a table of 13 on Sunday. Rave reviews. It’s one of my all time favorites. I am tempted to take my husbands breakfast yogurt for this recipe. yum! Im surprised this question hasn’t been asked already but… I already have unsweetened coconut on hand. Would you recommend reducing the sugar and by how much? And here I thought you just had fancier muffin liners :) I agree with previous commmenters that this could be a great way to work some rum into my morning diet. These look amazing. I’m going to try them for a dinner party I’m holding this weekend. Thanks for posting! Ooooh, yum! Cannot wait to try these muffins. And then several of the variations. I’ve recently begun cooking and baking with coconut oil too and am happy to see a recipe tested by you that uses it! To save you a dirty pan–pop the jar of coconut oil in hot water for a few minutes. You’ll get enough liquid oil to pour out for a recipe without having to actually dirty a pan! 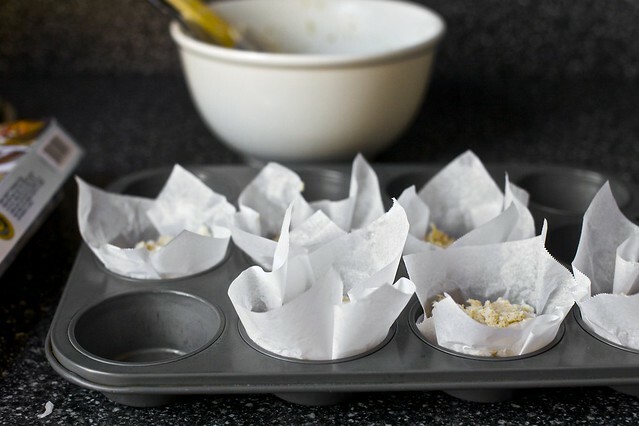 would using a glass to press the papers into the muffin pan help them fit before the batter any better? I love all and anything coconut!! Thanks for sharing – beautiful muffins! These look fabulous. I have a new-found appreciation for coconut the past 5 years or so and coconut oil is my BFF. Love the stuff. I also like how you used parchment papers rather than liners…very cool and I’ve never done this. Must try to avoid those ripple marks that liners leave. Do you think this would turn out if I baked it as a cake? I like coconut oil best in things like these muffins, applications that are tropical in nature. Enjoy your vacation! 1) I can’t wait for your book to come out! How many months to go now? 2) I need a vacation ASAP as well. 3) Until recently I thought coconut oil was unhealthy and I was rather sad about it since anything coconut is, well, amazing. 5) With chocolate chips? Oh yes! What is the final muffin consistency? Would a crumbled version work as cakepops? I bet it would taste great but I wonder if it’s too “fatty” to stick together. Or if the oil might ooze out if not covered with chocolate right away. Since I can’t have a tropical getaway, these will have to be close enough. And I can’t even taaaaake the picture with the post-nap hair. OMG. The liners is such a great idea!!!!!!!!!!! Taking it one (obsessive) step further, you could make these quadruple coconut muffins using the coconut milk idea and coconut flour. Maybe that’s taking it a little too far ;) I love the tangy Greek yogurt addition – I bet this gives the muffin a full body (for lack of a better term) flavor. I’m right there with you on the dregs of winter…here in the Sierra mountains, we typically have about a 2-month long period where we get rain/slush, which ruins the snow for outdoor activity and summer doesn’t really present itself here until the end of June. Just a little more time before the homestretch ;) Have a great week, Deb! I bet these smell divine! I just passed up coconut oil last night at the grocery store because I didn’t know what I’d do with it. I’m going to have to go back next week and pick some up because these look wonderful! It looks like you used a good amount for this recipe but I’ll have to do some research to see what else I can use it with. I just made the batter and planned on baking them in a day or two…should I be worried about the coconut oil re-solidifying in the fridge? This just occurred to me. Before going to sleep last night I was searching the web for some kind of banana coconut muffin recipe to use up some leftover coconut milk and old bananas. Perfect timing! I’ll be writing about it soon enough on my blog I recently started (www.brittanycooks.com)!! Thank you..I really enjoy reading your blog, and love all of your pictures!! Hi Deb! I love these muffins! Coconuts are not around my kitchen very often but your muffins looks delicious! very very nice the paper to cook them, instead of the classic ones.. congratulations on your book, I have seen Knopf will be the editor.. like the first book by Julia Child! kind of good luck charm! I bet your book will be a great success! How could I find it here in ITALY? a big hug! Francesca – Bologna, Italy. These look amazing. I want to try the pina colada variation. The BF would flip over those. Especially if they were the triple coconut. LOVE this recipe! Made it this afternoon. Added the sugar to the wet ingredients before mixing with the dry. I got 9 muffins out of it. For the record, this total recipe is about 2430 Calories (for me, 270 cal/muffin. for 10 muffins, its 243 cal/muffin. For 12, it would be about 202 cal/muffin. Yum, yum, thanks for another great one, Deb! I just made these and they are delicious!!! I made 6 plain and 6 with dark chocolate chips ala Mounds. YUM!!!! Hi and thanks for the recipe! I made it with one cup of chopped pineapple added to the mix at the end. Just a small tip – the directions do not mention adding in the sugar. You may wish to amend the directions and presumably the sugar would be added with the dry ingredients. My version made 12 muffins and they needed at least 28 minutes in a 375 degree oven. YUM. You are such a rock star! These look wonderful. There are going to be breakfast muffins this weekend:-). I love coconut oil for anything…as a cooking ingredient or beauty product. As a cooking oil I found it difficult to shell out $10+ but if I looked at it as a moisturizer and intensive hair conditioner it became affordable. I use it for everything:-). My coconut-obsessed self saw just the title of this post as the page was loading and said to myself “Yes, yes she did.” These will be made immediately. They look great, but I’ll pass. I’m allergic to coconut. However, the frozen tropical drink idea sounds just divine! Oh wow! Those look dangerous, love coconut. This looks like the perfect winter blues recipe! I can’t wait to try the coconut oil. My kids are big coconut lovers AND big muffin lovers, so this looks like just the kind of thing that will win Mama big points! Somehow I can feel the sea breeze, the scent of sunscreen on my skin and ooh does that vitamin D feel good…and the muffins, well that just about does it for me, especially the pina colada version. Thank you, you’ve done well. I fully agree with your muffin rules. They’re breakfast all the way! These look dreamy! I can smell the coconut just looking at them! These look dreamy. Lately I’ve been intrigued by coconut oil. One question, a general one- when you are developing recipes, specifically baking recipes, how do you know what basic proportions to use? I love to adapt and modify recipes, but how do you (or do you) start from scratch? Specific measurements like leavening and ratios of flours to fats always leaves me wondering. I certainly don’t want my muffins to come out like cookies! Any tips? I went to the store tonight for yogurt, coconut oil and coconut and macadamia nuts. In the morning I plan to make these with half yogurt and half mashed banana. As Shelley noted, there is no direction for when to add the sugar, but I will add it with the dry ingredients. Sugar — Whoops! Now fixed. Sorry for the confusion. Stephanie — Great question. I made no less than 16 versions of a muffin before I found the one I wanted to put in my cookbook. They were all over the map, from fruit to grain to yogurt to… I kept coming back to a few formulas that I liked for muffins, and use them endlessly. It’s not a one-size-fits-all solution (I use more fat here than in other muffins; it allowed me to use more whole wheat flour with no compromised tenderness and to add a coarse, dry ingredient like shredded coconut with no drama; I use less sugar because the coconut is sweetened, etc.). So, yes, you can ultimately fiddle around in the kitchen enough to find your favorite formulas, and then you adjust them (everything from flour to sugar to fat to leavener levels and choices) to the ingredients you’re using, based on what you know about them. Francesca — Thank you. Anyone, anywhere will be able to buy the book from online booksellers. Knopf acquired world rights to the cookbook; they’ll aim to place the book with foreign publishers around the world. But we won’t know for a little while longer whether it will be widely available. I’ll keep everyone posted as soon as I know more. I am CRAZY about coconut. I would love to try this recipe, but I’ve never worked with coconut oil…first time for everything! Up here in Northern Michigan we have only two seasons a year: winter, and road construction. Summer is just 3 months of bad skiing. I like to fill my winter days with rich braises and frothy local beers. Slainje! I made the muffins without sugar (before the amendment! I didn’t even notice until after! ), and although I can tell the sugar is missing, they’re still tasty (thanks to the sweetened coconut). How long should the you egg and yogurt be left out to get to room temperature before using. Your blog is the best! Smitten Kitchen is well known in our house. These muffins look lovely. Any reason why full fat greek yogurt is necessary given the coconut oil? Since you note that one can substitute coconut milk or bananas in the headnotes, I was thinking I could use 2% or even 0%…Also, if I wanted a slightly sweeter muffin, would increasing the sugar to 1/2 cup ruin the ratio. Finally, I love when you post! atg — You can probably use reduced fat; it would be fine. But it is the most moist and tender with full-fat. Ann — You want them to not feel cold from the fridge; room temperature. The muffins will still turn out great if they’re not, but the batter gets very thick and harder to stir. Deb – these look wonderful. If this recipe is half as good as your blueberry muffins, they will be amazing. Thanks for the heads up on where to find the coconut oil, I have not seen this at the grocery store but will pick some up tomorrow. You deserve the rest, you are a working Mom after all. Take care of yourself and rest up before you know it you will be on your book tour. I hope you come to Phoenix. A tip for keeping parchment stuck inside baking pans (works well for brownies, too): grease the pan first, then press the paper into place. Should work like a charm. i’m thinking these would be mighty fine with some of the wide flake (“natural”, they call it) coconut we keep on hand for granola and eating out of hand, by the fistful. and call me crazy, but a toss of bittersweet chocolate shards might put me in the mind of Mounds… though that might DQ it from breakfast territory. only maybe. . . . . *shhhhhh* . . . Do you hear that? That’s me . . . whimpering . . . you’re killing me here! I can’t wait to try these! ! ! Mmmm those sound yummy. I recently made Nigella Lawson’s Tropical Chocolate cake from feast. I took it to a dinner party and everybody oooh’d and ahhhh’d. Chocolate and coconut was apparently unexpected. This post has given me some great ideas! I have been looking for an excuse to buy coconut oil and you just gave me one, thank you! Made these tonight and they are so moist and delicious. I used unsweetened shredded coconut and upped the sugar to 1/2cup to compensate. It’s not too sweet, perfect for a breakfast muffin. I might have to buy some lime curd to smear on top. Yum! I ALWAYS get more muffins than a recipe says, but hey! I got 10! And they smell amazing. I subbed 1/4 cup of the ap flour for barley flour (have you baked with barley flour? It’s fantastic — not too assertive or dense, like some other alt-grain flours can be) and added in 1 T of carob powder and some chocolate chips. Oh la la! This recipe looks amazingly delicious. Side note: I’ve been skipping the first half of your posts to get to the recipes. We all get wrapped up in work, and I know you’re busy with the book, but please write about something a little more interesting, like maybe the baby, or your husband, or the weather. Anything but going over changes for the book, and how tired it makes you. Awesome. I’m so glad you addressed the muffins being breakfast food not cake issue here, AND that you showed me how to make parchment muffin liners. For Pete’s sake. I haven’t been able to find any where I live, and I’ve just been avoiding making any sort of sticky muffins after dealing with the immense frustration of losing half my muffins to paper linings. You, madam, are a genius. I feel almost sacreligous asking this, but is there any subsitute (both in terms of flavor and consistency) for the coconut oil? I live in the Congo where coconuts and coconut products abound (shredded coconut, coconut milk, etc, etc), but coconut oil has not quite made it to this side of the pond. I would love to find a way to make these muffins for a staff meeting next week, and make some teachers far from home very happy. Deb – if you are dreaming of tropical wonderlands, please come visit us here in San Diego. This whole week the weather has been 75+ degrees! As for food, we have had local strawberries since December, so I’ve been making shortcakes and scones and cobblers for two months! PS – No, I’m not a PR person for the city – I just want everyone to experience the calm of blue skies, blue water and warm healing sunshine! HIII! I made these and they were delicious, I added the pineapple as advised just thought id point out that the recipe calls for sugar but the instructions don’t ever tell you to incorporate sugar. as such i ended up with very delicious healthy muffins but they could have been sweeter. thank you! This is SO right up my alley, and will be my Oscar Party treat. Horray! Oh, btw, is everyone aware that Smitten Kitchen Cookbook is available to Pre-order on Amazon? Wooohoo! :D Order away people!!! I have exactly the same jar of coconut oil that you showed in your picture and I bought it on a whim at the grocery store. I haven’t used as much of it as I would like to and have been looking for things to use it in. Yay for coconut muffins and I love all the adaptations you have given too! Love the parchment paper liners . . . a great tip! This looks so amazing. I always think that parchment liners look fancier than normal liners anyways. Such fancy little muffins these are with healthy coconut oil and greek yogurt…they do indeed deserve individual wax paper thrones to reside in! I tried the recipe with entirely all-purpose flower and they came out quite chewy. I wonder if yours were chewy too… Thanks! Oooo I wonder if I could sub some coconut flour in there too! these could be made gluten free so easily! Thanks Deb. Did you notice the amount of chocolate there has been on this date the past five years? Im seeing a trend here. I will make these but instead of using a muffin tin, scoop them out like cookie dough to make large muffin tops. Never make muffins as muffins anymore. They are easier to transport as muffin/cookie shapes and that way you always get the best part of the muffin – only the top. I find that my ice cream scoop makes the perfect size. These look delicious, can’t wait to try them! I’ve some yogurt lurking in the fridge and a packet of coconut just begging to be turned into something scrumptious. Never seen coconut oil for sale over here but will try our local equivalent of Whole Foods. Am hoping your book will be released in the UK! Excellent recipe! I almost always have coconut oil and shredded/flaked coconut about, but have never used both at once. I substituted rye flour as I didn’t have any whole wheat flour and it worked just fine; I also added 1/2 cup frozen blueberries to the batter (it just made the whole thing seem more healthy, so when I am on my fourth muffin of the day I can tell myself Hey! They’ve got berries in them!). Hi Deb – I recently used melted coconut oil in a granola recipe and loved it. I’m curious if you tried the muffins using melted oil and how it affected the texture. I imagine if you did it didn’t work out well since you specify to heat the oil to almost melted. Thanks for another great recipe! Hi Ashley — I suggest that you heat the oil just until it melts, because at that point it’s more liquid than not and can easily be whisked in with the other ingredients. Fully liquid is fine as well; what I hoped to keep people from doing was making it very hot, because then you’d want to cool it down before adding it to ingredients that could curdle, such as eggs. That said, I might have been more paranoid than necessary; melted is just fine — just not simmering. Hi Victoria — The book hasn’t been sold to a UK publisher yet (I believe they need the book to be in pages first, which is what they’re working on now) but it likely will be. I will keep you posted. Nataly — Ha! Valentines week is what most of those date back to. I’m so far behind on posting this year that the catch-up from years past at the end reflects not just the last few days but the last couple weeks of previous years. Ayumi — 1 cup should be fine. I usually make muffins like this with a proportion of 3/4 cup puree, but really, an extra 1/4 cup would only make them lovelier, I’m sure. Sara — Melted butter, olive oil or any other oil you like to bake with. Emily Rae — Yes! I love it. I especially love barley flour in this strawberry summer cake and these blueberry pancakes. Jo — Thank you! I would love to come to Phoenix. Jean — I don’t usually indulge negative comments, but, yes: The first half of this post is awfully grumpy. That said, it’s important to me not to try to advertise a life that is all sunshine and cheer and would only make others feel that their more normal lives, with ups and downs, pale in comparison. It would be dishonest and I’m not here to brag. Nevertheless, this morning, I stood at my kitchen window eating totally out of season but surprisingly delicious strawberries, sunlight steaming on my face. I realized that I’d miscalculated, and my mini-vacation is actually only one week from now and I am 100% less grumpy than I was when I wrote this, chomping at the bit to get new recipes up here. Ups and downs. Just like normal people. Do you have a gluten-free version of this? Could I perhaps make them w/ almond meal instead of flour? My mom would go crazy for these – she’s a coconut addict! I LOVE your website and I am always so excited to get a new recipe from you! Thanks for all of your hard work and dedication to amazing food! I wanted to find out if I can make these muffins with coconut flour. I am on a gluten-restricted diet and coconut flour is a staple in my house, along with almond flour. I am a big fan of coconut oil and I use it to cook almost everything. It’s great for stir frying because of the high smoke point. I would love to make these muffins, but I’m curious what you think about the use of coconut flour as opposed to whole wheat or white. Gorgeous photos and a recipe I can’t wait to try! Also anticipating the release of your cookbook this fall. I think you have to follow your gut and ask for changes and design edits that really matter to you, the author! It must take a tremendous amount of time and energy…but as a graphic designer, I sometimes had to shiver at some of the layout changes writers would ask for in the late stages of a project. Because one change often affects other elements that also need to change, this can sometimes add huge amounts of time to a designer’s job. Hopefully, good communication between writer and designer at the beginning can help minimize big changes, but from my experience, there’s never been a design project without some design changes being made. You may hurt me for this comment… but I live somewhere where coconut is a readily available ingrediant and hence I’d like to make this with the stuff from the coconut and not from a bag. As such, when you say ‘sweetened shredded coconut’, how sweet is this? Trying to work out about how much sugar i’d have to mix it with to get a similar effect. The parchment paper instead of muffin liners is genius! I can’t believe that has never dawned on me, thanks for the awesome tip! I’ve never really liked coconut; however, have thought that when presented with the right recipe, it would win me over. Just looking at these is enough to make a believer out of me! is it possible to substitute coconut oil with coconut butter (which i currently have a large jar of)? thanks! Coconut and muffins together sounds amazing! Mhmm I love anything with coconut milk or oil. 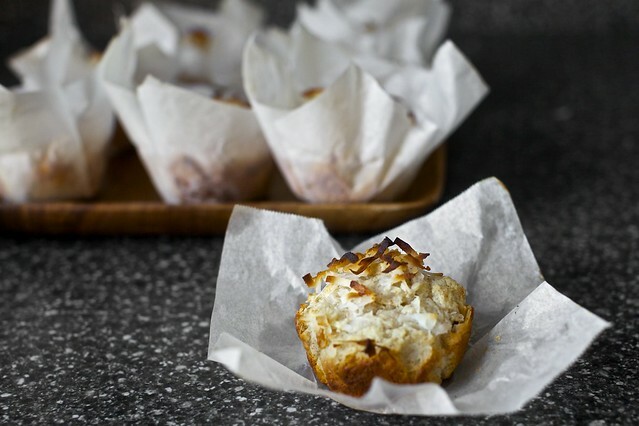 The shredded coconut I’m so fond of, but these muffins look delicious anyways. I just read this post while listening to Jimmy Buffett’s “Banana Republics.” It only made the longing for something tropical that much worse! Those combinations of muffins that you suggested sound incredible. I made a coconut bread recently, and I fell in love. I’m thinking maybe macadamia nuts and pineapple to start! Thanks for the other barley flour recipes! I believe I even have the exact pie pan in the strawberry summer cake pictures. Hi Deb, I believe you have an extra word (things) in the second sentence of your second paragraph–I only noticed because I started trying to read that paragraph about 10 times and kept getting interrupted by my little two-year-old boy. In reference to the negative comment you responded to, I appreciate your honesty about the ups and downs of your life. SO MUCH. To be honest, though, I don’t find it uninteresting or dull at all. Even your “downs” seem lovely, the way you write about them is fun and entertaining, and relatable in a way that helps me see the charm in some of the things we have in common (see interrupting two-year-old boy, for one). I have undertaken a blog myself lately, and you were and are a big inspiration to me as I stumble along. I aspire to write, and cook, like you. I don’t have any tropical vacations planned any time soon, but your blog is my mini-getaway. Really. I enjoy having a quiet moment at naptime to read your latest post, eating a blueberry scone or somesuch, so thank you, and keep up the good work! Half an hour later they are in the oven, pineapple inside and tiny yellow stars on top (they make everything better). Fingers crossed they are as delicious as yours and do not taste like shampoo! P.S. One of the things that helps me to differentiate a muffin from a cupcake is that muffins don’t always need the frilly party dress of a paper liner. A nonstick muffin tin or plenty of oil/butter is sufficient to help them roll out of bed, maybe not looking as cute or glamorous as a cupcake, but still delicious for breakfast. Hey there. I only have unsweetened coconut flakes. I was thinking to just toss them in a bowl with sugar until its sort of coated. Do you think that’ll work? Thank you, can’t wait to make these. I have been obssessed with coconut lately, since discovering coconut chips which are really just giant flakes of coconut and not chips at all but so much wonderful flavor. Just made them last night! What a delight! We used non-fat greek yogurt and still tasted wonderful. I noticed the recipe calls for 1/3 cup granulated sugar but I don’t see where it is actually used in yours. Oh I can’t wait to try these. I actually posted Winter Squash Coconut muffins on my blog yesterday. They have ginger and lots of coconut milk in them so a bit different but who needs only one coconut muffin recipe?! Yes..another vote for San Diego. Local strawberry season is here and it is divine! really nice idea to combine the easy yogurt cake with the coconut oil flavor! my next muffin will be ina’s lemon cake with coconut oil for sure. i made these (well… a variation. added chocolate chips and toasted pecans.. and we’re back to dessert.) last night and i thought i’d let you know that in the recipe instructions you forgot to add the sugar into the wet-ingredient-whisking-together directions, so you should add that in there so someone doesn’t accidentally forget! woah! looks like i’m late on that one.. my recipe was still up from yesterday, hadn’t refreshed the page. sorry! I made these before the sugar was added into the directions…so they’re not at all sweet but still pretty good! I’ll definitely make them again (the right way!). I completely disagree with Jean- your daily life is what makes this blog so interesting. I have been there especially looking out at the gloomy Seattle weather. Funnilly enough, today was sunshiney and made me happt. The sun was out for 15 mins though :0 And these look lovely. I have grown up with coconut oil but have not used it in recent years. I have to make these for our sunday brunch which we decided smitten style to never eat out again. Thanks again for sharing your daily life with us. Your ups and downs make you normal and we adore you for it. Divine! Been on a coconut kick lately. Can’t wait to make this. Wonderful! My 16 month old loved his afternoon muffin! Thank you for a delicious and easy recipe! I have been going through coconut oil lately like crazy! I have been making Melissa Clark’s” Double Coconut Granola”, and we can’t stop eating it!! Now I have a new use foir it. Hi Deb, I agree with Arti….keep writing about the ups and downs. Cooking is about life, which affects how and what we choose to cook. I really enjoyed your blueberry muffins. They led to a life-brightening experience with your blueberry crumb bars and lemon bars, both do which are great! yum. I just made them with the following changes, still yummy. Switched the amount of whole wheat and white flour (more whole wheat than white), buttermilk in place of yogurt, and unsweetened coconut. To make up for the unsweetened coconut, I mixed in a little sugar and a dash of coconut oil – made a great crunchy topping. May I just say that I love reading your newsletter, and browsing thru your website. Thanks for sharing with us! And these muffins look really good, too! Yum! I made these tonight with lemon flavoured yogurt and got 12, although they are a bit on the small side. Made a bit of cream cheese icing and sprinkled them with toasted coconut and macadamia nuts. Yum!! Thanks a million for the recipe, perfect timing since I was looking to use up the bottom of my jar of coconut oil. AJ—If you want to use coconut milk in place of the yogurt, you might try using coconut CREAM. While I think you can actually buy it on it’s own, it’s really just the thick stuff that separates from the thin stuff in a can of coconut milk. In my house it just happens in the can in the pantry, because my kitchen is fairly cool, but you could refrigerate the coconut milk to make the separation happen. I’m not that big a fan of coconut (although I love to use coconut oil) but this looks really tempting! Have to make this – as soon as I quit this stupid self-imposed diet of mine (started it today, finishing it probably tomorrow)… Well it’s still a while ’til summer, right? Toasted coconut is one of the finer things. I made these and was surprised by how light and fluffy they were, despite the whole wheat flour. I’ve also been craving coconut and sunshine lately. I just bought some coconut scented perfume oil to remind me of the beach! I might add more shredded coconut next time because I love the texture. Please take no notice of comments such as Jean’s… You continue to write about what makes you and your day tick… We love to read it! I love everything coconut and this looks decadent! I love the paper liners that wrap these muffins. I used trader joes fat free vanilla Greek yogurt bc that’s what I had in the fridge but i do want to try this fab recipe with whole fat Greek yogurt! the little pumpkins who I take care of (as their nanny) even asked for some (after demanding what I was making) so thats two positive reviews from three years and 19 months! We love them so thank you thank you! Also I thoroughly enjoyed reading your entire post, thanks for being honest and doing it so eloquently! Sorry for the typo….They’re easy to fold and CREASE….. I seriously check your blog every day to see if a new post has arrived. It has it’s own little bookmark tab at the top of my browser. No waiting to see if it comes through my RSS feeds (I’m always way behind anyway)! And as for you being honest about the ups/downs – good on you. I think it’s dangerous for us to see the constantly ‘perfect’ lives of bloggers and feel unsuccessful or not perfect enough or happy enough in comparison. That said, I do appreciate that you’re not all whiny about the crap that happens :D You’ve got a good attitude and a healthy dose of reality. Enjoy your trip! I’ll admit I’m incredibly jealous, but you deserve it! I love that these are unique – something different from your everyday blueberry muffin. Very refreshing! I love cooking with coconut oil. Thanks for sharing! I immediately bookmarked this recipe! I’ve never cooked with coconut oil and will have to try it out. Hi Deb! Love, love, love your blog. Thanks for the inspiration. One question…could I substitute coconut and/or almond flour for the others? I’m trying to avoid wheat. Hi Angela — I only tested this muffin with white and whole wheat flours, so I cannot say for sure. In general, partial swaps with fine meals (almond flour, coconut flour) almost always work but to do a full swap, you might find more density/less tenderness. But, it’s a pretty easy recipe to try out with a full swap. Even if you end up with dense muffins, I doubt they would taste bad. These are delicious! And I made them in one pot..
I’m super lazy, so I melted the oil in a pot, then mixed in the egg/yogurt/sugar, then sprinkled the baking powder and salt over the mixture, then stirred in the flours and coconut (and chocolate chips and walnuts). It still worked great and I had fewer dishes to wash! Oh Deb. I live in Sydney and am going to the beach in precisely 20 minutes. Jealous? Also, coconut oil is delicious! Growing up in a southern Indian household, we always had a small bottle of the virgin stuff around. But to be honest, we were more likely to use it as a hair conditioner than in food. A few drops in a rice based dish makes all the difference though. In larger quantities, it still kind of reminds me of washing my hair. I made a coconut oil based frosting the other day and took it to my mother who was getting increasingly confused with each bite. Everyone loves it now, but there’s just this association we can’t seem to kick…but as a new vegan, it’s such a great fat to experiment with. Vidya- I can so relate..coconut oil to me means Friday hair conditioning. I need to kick that association and make these muffins. We made these this afternoon, and they were awesome! Oooh my goodness! I have to make this recipe this weekend. I was having problems sleeping and just came across this recipe. I will run to the store in the morning and get the ingredients I need to make this delightful recipe today. Two of my great grand children are coming to visit this weekend and I’m so excited. Actually, that’s why I can’t sleep, because they are coming to visit and I have not seen them in almost 6 weeks! So, I will make the double coconut muffins for sure this weekend and thank you so much for putting it on the web! I do so adore you. Your honesty, dedication and integrity. Thank you for these muffins. Personally, I’ll be embellishing them with milk chocolate somehow, someway. Once again you’re efforts will make my family’s weekend special. WOW! Great recipe. I saw this last night and had to adapt it a bit based on what I had on hand..I didn’t have greek yogurt so I used an equivalent amount of large curd cottage cheese (food processed to be smooth) and subbed unsweetened shredded coconut. I did add in only a half cup of chocolate chips and it was the perfect amount for me. Almost like a “Mounds” bar in a muffin form. Love it! Ack! I just made these and they deflated. They were baking beautifully but took longer than 20 min in my oven. I did have to make a few changes but from reading evryone elses experiences, i thought i’d be ok. I used 2% pineapple greek yogurt and 1/4 cup brown sugar instead of 1/3 c white. I took someones reccomendation of subbing some barley flour. I skipped the coconut flakes and added blue berries. Reading back over this it sounds like i greatly altered it which is one of my pet peeves for someone to say “I followed your recipe and they didn’t turn out.” um, no you didn’t. Does anyone have any ideas of which change caused my sad flat muffins? They’re cooling now and smell great, but look sad. Thanks! I love your blog and cant wait for your book! I just made a batch of these this morning to kick the weekend off! I can’t wait to sink my teeth into one : ) I used coconut milk since I had some on hand and no Greek yoghurt. I also added some chopped dates I happened to have and some almond nut bits. Thank you for this versatile and delicious recipe. Big kudos for everyone who commented AFTER making the muffins! Sorry to also be guilty of posting without making! We all know her recipes sound great-that’s why she posted it! This recipe sounded so wonderful i had to go out and find this new treasure “coconut oil.” After finally finding it in the organic section, (not in the baking section with other cooking oils) i was disappointed at the price i was going to have to pay. I made a quick decision to pass on a few extra snacks and purchase the coconut oil. That evening as i was getting out the ingredients to make the muffins i opened the coconut oil, stuck in the tip of my finger and popped it into my mouth expecting a mild coconut flavor…..it tasted like oil,disappoinment set in but i continued on with the recipe and was SO glad i did. They were heavenly. I must confess my few changes: no yogurt on hand so sour cream and buttermilk were a perfect substitute they still added the tang Deb mentioned. I did add a half teaspoon of coconut extract and cut the vanilla to a half teaspoon also. I got 11perfect sized muffins. Now i cant wait for other cooking uses with my “new treasure”. Thank you! Coconut is yummy, but what caught my eye was the presentation of these muffins. Right out of the oven, they look like the premium tropical produce you get wrapped in tissue paper from specialty houses. I’ll bring the muffin tin to the table to maintain that wrapped look. The second batch will be lime-coconut. I’m no expert (and maybe someone has already mentioned this) but I wonder about baking with sweetened and flavored yogurts (some with no or low fat) that rely on pectin or gelatin to give the product body. Deb’s recipe calls for full fat greek style yogurt. It is thick and rich because some of the whey has been strained away. Thanks for another great recipe. Just finished making them and my family couldn’t even wait for them too cool. They were a big hit. I used unsweetened shredded coconut and upped the sugar by 1/4 cup as Deb suggested in the comments. I also used full-fat plain yogurt rather Greek because that’s what I used in the house. Finally, I did get 12 muffins, but the liners I used (from Ikea) were slightly smaller than my muffin tins, so I don’t know if that made a difference. Thanks as always for keeping my family happily fed. Can’t wait to make these for my mother-in-law. She’s heading to Pakistan soon so perhaps a box of muffins in her suitcase will be a nice reminder of home, she loves coconut. Also, I respect Jean’s opinion but disagree with it- if you didn’t seem like a normal person I’d find your site and your recipes a lot less approachable and I’d never pluck up the courage to try. The fact that you occasionally get fed up or tired etc is a good reminder that you’re a real person. Otherwise I might think there’s a whole TEAM of highly qualified professionals who cook, write and photograph for this blog- wouldn’t be inspiring! Had to laugh at the idea of pulling out my moisturizer/cleanser/makeup remover to bake a batch of muffins! I do have to admit to sneaking a taste every now and then. This may just be the new miracle food! Can’t wait to try these muffins. BTW, I love reading about your life, especially with Jacob. I have a grandson of about the same age who also has wild, curly locks and the cutest smile on the planet. If we were closer together (I’m in Texas), I’d arrange a playdate! Made these for breakfast with all white/wheat flour, a ripe smashed banana, and the juice of a lime. yum! Your blog is entirely and delightfully addictive. I had to stop and tell you how impressing and inspirational your blogging story is. I am a beginner blogger and you have really motivated me to go on. Kisses and hugs :). Made these with coconut flour (instead of ap & ww flour), agave (instead of sugar), coconut yogurt and coconut milk (instead of greek yogurt) and unsweetened coconut flakes, and they were still very delicious. A little tender inside, but really good for gluten and dairy free. I tried these today — used a mini-muffin tin & baked for 15 minutes instead of 20. Yummy! Oh my. Two of my favorite things! Coconut and muffins. Tomorrow morning my house will smell like these! Thanks so much for the great effort on your part to share with us all. Jackie — The stiffening of the dough while mixing shouldn’t affect the crumb of the final muffin. Mine got suuuuuper stiff too, like cookie dough, and they were still tender in the end. That said, the muffin is on the dense side, in general. It’s not a particularly fluffy muffin, but it should be tender/rich. I keep muffin batters on the dense side so that when fruit is added, it does not sink. However, if it wasn’t very moist, the combination of 2%, scant cup and unsweetened coconut, which is fully dry when sweet coconut is not, could have definitely been the culprit. I made these this morning and added 1 mashed banana. I also put about 1/4 cup less yogurt in. They were so good, my husband said they were 1 of the best muffins he has ever eaten – and yes, I got 10 out of the batter, not a dozen~ in fact, i think next time I will make 9 very nice sized ones. thanks for the recipe! I just made these, and added lime zest, and it was just delicious!! Thanks for all the great recipes! These look so good!! I got some coconut oil on a great deal and have been using to make lip balm and deoderant but I think I am going to have to set aside 1/2 cup for these!! Thanks for sharing! Made these on the recommendation of one of my readers; I altered the recipe slightly with the addition of about 1/3 c. of semi-sweet Baker’s chocolate chunked up with a knife and a tsp. of coconut extract. The family was stoked, and I’ll be making another batch by tomorrow, I would imagine. Thanks for what will likely be a staple in our house! i love your post. ‘the dregs of winter’ is such a perfect term, and you so perfectly describe how i’m feeling (except, unfortunately, without the tropical trip coming up). these muffins are gorgeous to boot! Just made these–yum! I did make some changes, however, that I thought I’d share for others. I substituted an equal amount of maple syrup for the sugar. I also used (unsweetened) dessicated coconut instead of sweetened shredded coconut (did not increase sweetener and don’t feel it was necessary after tasting them). Finally, didn’t have greek yogurt, so I used coconut milk. Because the dessicated coconut is so much drier than sweetened coconut, I soaked it in the coconut milk for awhile before. Oh, I also made them as mini muffins. Yield was 22 and baked for about 17 mins. Can’t wait to try with your suggested variations! I have a bunch of coconut just waiting to get used, this looks like a great way to do it. I made these with coconut milk instead of yogurt because I had just the right amount leftover from the peanut sauce I made for dinner. I used all white flour, but it’s a locally grown and milled white pastry flour that is so fresh. It’s similar to whole wheat pastry flour. It’s nothing like other white flours I’ve had. Splendid! That’s an innovative use of using parchment for muffin cups. Great idea! made these today, swapping greek yogurt for coconut milk (full fat) and adding mini chocolate chips. i also used unsweetened coconut, since that’s what i had on hand. they are delicious! i got 12 (smallish) muffins. i’ve been cooking with coconut milk and oil a lot lately, such a great and easy way to make dairy-free desserts! Just made these with unsweetened coconut curls (the big wide ones). I compensated by increasing the sugar to 1/2c, and sprinkling a tiny bit more sugar on top before baking. It worked, they’re delicious. My friend just made a version of these for us this afternoon- gluten free! I’m in love with everything coconut – can’t wait to try these this afternoon! They look absolutely delectable and I know the aromas will whisk me away to a fantasy of some tropical paradise. So glad to have found you! Yummy! I made them as written the first time. I will add mango or pineapple next time. It is the first time I have used coconut oil, but not the last! I am a major “lover” of anything coconut! I just made these and they were delicious! Half regular and half with chocolate chips, that way I have some for breakfast and dessert! Thanks for this amazing recipe! My husband loves the taste of coconut second only to vanilla! So he was very keen that I make these muffins this morning to take as a house gift for brunch. However, I only had unsweetened coconut which I suspected would be neither moist nor sweet enough. Nonetheless I tried it, adding an additional 1/8th cup of sugar and doubling the vanilla (these were rather arbitrarily chosen additions). The mixture made enough for 9 rather small muffins, which looked, I have to say, rather underwhelming. I took them anyway and was so pleased that they were, in fact, delicious. They might be nicer a little sweeter – I’ll try with sweetened coconut next week (for another brunch invitation) and I like the idea of adding some fresh pineapple – but the unsweetened version really has subtle wheaty coconut plainness that was very pleasant. Despite looking like not much they all got eaten. Just made these instead of studying for my physics midterm! I made a few alterations. I have halved the recipe, I only had al purpose flour on hand, along with vanilla full fat yogurt, so I did not add any vanilla. I also decreased the sugar since I was using vanilla yogurt. The yogurt was a bit tangy so I decide to add lime zest! Turned out great!!! Thanks for the recipe! Tried these on the weekend with my own curly-haired three-year old. I only had 0% yogourt in the house and will make it with full-fat next time as they weren’t as moist as I would have liked. They were really good though and I’ll be trying the mango version and the chocolate one too at some point, though the chocolate version will definitely require a workout afterwards. These are little muffin-shaped calorie bombs! I had full-fat sour cream and no yogurt – they are wonderful! I always share with a neighbor and she loved them too. We both agreed that they weren’t too sweet or too coconutty – just right! Keep up the good work!!!! I love coconut, am sick of winter, and cannot wait to make these! There’s no beach in my near future, but at least the oven will make the house toasty warm! These were delicious – dense, not too sweet, and they kept for days (thanks to the coconut oil I guess?). I think that you could use them in place of scones with tea and I wish that I had some clotted cream to put on them. I’m always searching for healthy muffin recipes. It always surprises me how many people don’t like coconut…what’s not to like?! I have made a similar version of these muffins with crushed pineapple and chopped crystallized ginger – excellent flavor combo!!!! These look lovely! I’m thinking of subbing a mixture of brown rice flour, coconut flour, and amaranth flour for the all-purpose flour so that us gluten-free people can enjoy! Now I just need to find my muffin pan…. These are gorgeous. I’ve been using coconut oil for sautés and the like for awhile now, but it hadn’t even occurred to me that you could use it for baking. And I can absolutely get on board with the breakfast-friendly ingredients. Trying these this afternoon. Also, Deb, I have to say that I’ve been reading your posts for a couple of years now, and am consistently impressed not only with your culinary prowess, but with the quality and charm of your writing. Cheers! These were fun to make and very good to eat! *I got 11 small muffins out of the batter, but next time, might just stick to 9 or 10 bigger muffins. *I immersed the (closed) jar in warm water instead of using the saucepan trick to melt the coconut oil. *I froze the left-over muffins and ate one this morning out of the freezer for breakfast. I just stuck it in the microwave on defrost for 2 minutes and it turned out beautifully. It’s a rare muffin that survives both the freezer and the microwave! *While these were very good, I did think that they were missing some zing. I’m looking forward to trying them with pineapple, cherries, or chocolate. Funny to see this after I made -in the same week, mind you- fresh coconut cupcakes AND pancakes with coconut oil… Maybe the universe is encouraging me to continue eating coconut? These look really good, so will definitely try them out. Love your blog! I made these according to your recipe, and they turned out very well. FYI, my effort yielded 11 muffins. No way I could have stretched it to 12. I want to make mini muffins next – would be perfect for a brunch. In a small sauce pan heat : 1/4 cup water + 4 tsp sugar just until the sugar is dissolved. Remove pan from the heat, and stir in 1 cup of shredded unsweetened coconut until the water is absorbed. When I used this method, the sweetened coconut was beautifully moist and not at all soggy. The unsweetened coconut was on the fairly dry originally. If you try this and discover that the sweetened coconut is too moist, simply spread it on a plate or cookie sheet until some of the moisture evaporates. Gypsy — Indeed! Thank you. I substituted 3/4 cup margarine for the coconut oil and used a cup of coconut milk instead of yoghurt and all white flour, no whole wheat and it made the fluffiest moistest coconut cupcake! Coconuts can never go wrong. @Gypsy I baked about 12 our of my batch! Perfect….thanks! to add to my previous comment, i made a dozen on friday at work and then shared them and ran out too quick so i just had to make two dozen more on saturday of course! because seriouslt they are heavenly perfection sooo yummy! just a suggestion that i find works for me; if you dont have time to bring all your ingredients to room temp before you start, or is your kitchen is cold, or if you’re working with finicky ingredients, microwave individual ingredients for 5 second intervals until room temp (eggs, yogurt, etc.) i microwaved my coconut oil and yogurt combo once the oil started to seize up and resolidify and it worked beautifully! and i know for some people microwaving isn’t somethign they are interested in doing, but hey, for those who are it can really save a lot of time and frustration from things going wrong during a time crunch. also, at work i dont have a microwave but i was only makign a single batch and i suppose i pulled my ingredients out in enough time for them to lose their chill, but with the double batch the ingredients woudl have needed a lot longer to come to room temp and im glad i microwaved them. again, these muffins are wildly tasty. ps i had to hide them from my mom because she said that if i didnt stop her she would easily eat a hundred of them! lol thanks again for the incredible recipe!! Can I just say that I love you for awaking in me this old passion for cooking?! Your enthusiasm is contagious and my husband may end up mailing you a gift one of these days to thank you for the delicious food filling his plate lately! I am about to start the coconut muffins recipe as in a spree of buying food in bulk we ended up with a bag of the size of a potato sack full of shredded coconut! I made these with unsweetened coconut flakes and added an additional 1/4 c of sugar per Deb’s recommendation above. So delicious! The toasted coconut on top is simply dreamy. It inspired me to toast some on it’s own and add it to my steele cut oats this morning! I just made these…wow. My coconut was in the fridge, and totally solid, so I microwaved it until it was just a little on the hot side of warm, then added it to the rest of the wet ingredients and got everything mixed up before it started to set. These came out super light and moist even with the unsweetened coconut. Definitely making these again! Just made these muffins and they were divine…everything you said and more. I used spelt flour instead of whole wheat and unsweetened coconut instead of sweetened. Texture, crumb and flavour were amazing. Another tip: never run out of muffin liners by buying some cute silicon reusable ones–no waste and the muffins come out with no problem. These were absolutely delicious! Used whole wheat pastry flour, unsweetened coconut and 1/2 c. sugar instead of 1/3 c. (would have been fine with 1/3 c., but wanted to make up for not using sweetened coconut), used half regular yogurt because it was all I had, and (of course) a cup of chocolate chips, and they were so great. I love a flexible recipe :). I made three varieties- plain, dark chocolate chip and filled with raspberry preserves. My very discerning family loved the raspberry filling the most. Poop on Jean! This is YOUR blog, write about whatever you want, and we’ll keep reading!! I love you Deb! Yours is my go-to site for any recipe I’m looking for, can’t wait to try this one. I did those today, because I had the day off apart from a coffee-date with a friend and my boyfriend had left one egg for me for breakfast. I used only white flour, desiccated coconut rather than sweetened without increasing the sugar, surprisingly actually did have a jar of coconut oil, and I used a low fat non-greek yogurt – the really, really runny, almost drinkable kind. now I don’t know what they were supposed to be like, but mine are awesome enough for me to have eaten 4 today, my coffedate had 2, and my boyfriend 3. They’re awesome! oh, also – I melted the coconut oil in the microwave until there were only a couple of walnut-sized chunk in it, then stirred and let it rest for a minute (for me, it was one minute on the highest setting) before I stirred in the sugar and the rest of the wet ingredients – less dishes, less clean up, works wonderfully! Just made these….WOW are these ever GOOD!!!! Just made these, they are in the oven right at this moment in time. I hate to brag, but these are perfect for the hot Australian summer – coconut oil is already melted in it’s jar and mangoes are everywhere :) Thanks for the great recipe! I love these muffins. I made them this afternoon to serve as breakfasts for the rest of the week. I couldn’t wait until morning to try one. The texture is delightful and they are just the right amount of sweet! I swapped buttermilk for yogurt (I only had low-fat not greek yogurt but a metric ton of buttermilk – I bought a carton not realizing I still had most of one in the ‘fridge) but otherwise followed the recipe exactly. I’d like to try it with lime zest, but really, they are perfect as is. i didn’t think anything could top your pumpkin muffins, but these just might have done it! i made these this afternoon and they are simply divine! i never comment on blogs, so the fact that i’m leaving this message is a testament to the greatness of these muffins. Delicious! I used unsweetened coconut and they were perfect, not too sweet. Next time I will be adding chocolate and almonds for a decadent dessert muffin. My bf who hates all things coconut just finished off the batch for breakfast. I made these on the weekend, and they were the best muffins I’ve ever had! The yogurt made them delicious and tangy. I will definitely try adding pineapple next time. And, I just ate the last one today and it was still nice and moist. Thanks for another great recipe! I don’t think this question has been asked yet, and I can’t quite see it on the label, but did you use refined or unrefined coconut oil? I just recently started using unrefined coconut oil as a skin moisturizer and it’s done wonders in clearing up my acne and softening my dry winter skin. From the research I did it’s only unrefined that is recommended for skin because it’s more pure and isn’t as pore-clogging as the more processed refined oil. So I have a jar of unrefined, also the Spectrum brand and wondered if you (or anyone here) would recommend one over the other for baking purposes. I haven’t done too much cooking with it yet. I tried using it to do scrambled eggs but the taste isn’t quite right. I look forward to trying it with popcorn and these muffins too! I just pulled these out of the oven and of course could not wait for them to cool, they are delicious. A few notes: I used subbed whole wheat pastry for the whole wheat flour and I added some pineapple chunks because I had them left over from Hawaiian pizza night. Next time I may try lime or chocolate chips. It’s the first time I have cooked with coconut oil, now I am thinking what to do with it next. forgot to add, my yield was 10 muffins. no way I could stretch it further. just btw – I made these last weekend with the addition of orange zest, and they’re amazing! I made these today and they have magically disappeared! They are just so good. I ended up with 11! These look divine. Thanks for sharing this amazing recipe and these delicious photos! I just made these, and they are fantastic. I ended up using a little butter for some of the coconut oil, because I didn’t have as much as of the oil as I thought I did. They are so tender, like the best kind of cake. But not too sweet, so totally acceptable for breakfast. I did manage to fill a full 12-cup muffin tray, but I tend to make tiny muffins, so that probably explains it. Once again, a recipe that makes me antsy in anticipation of getting my hands on your book! These are amazing! I’ve baked them twice in the last week. They lasted really well – I was still eating them on day 4. I added in toasted macadamia nuts and used wholemeal spelt flour because that’s what I had on hand. The nuts and coconut made for a spectacular combination. Thanks so much Deb! I can’t say how many of your recipes have become favourites at my house. I just made these for brunch and they got devoured in a few minutes! I added some choc chips as i only had unsweetened coconut. They’re also not too sweet and a great breakfast/brunch addition. Considering there are almost 300 comments for this post, you probably don’t -need- my added comments, but here they are anyway! * I used room temperature coconut milk instead of yogurt (since my husband is lactose-intolerant and drinks it anyway; we had it on hand) and it worked like a charm. * I had just enough batter for 10 normal sized muffins. * I buttered my muffin tin, but did not use parchment paper and the muffins popped out easily! These might be some of the best muffins I’ve ever had! I love love love coconut oil so I was excited to try baking with it! These muffins are currently in the oven! I cannot wait. It was a lovely, sunny but chilly, lazy, muffin making kinda Sunday. I searched on your blog for muffin recipes because I wanted to try something new and these were the first to come up! They sounded sublime, so I immediately decided I wanted to make these. And now my house is filling with a soft coconutty aroma. Yummm. Thanks! I got a dozen out of the batter, mostly by accident – I have no counter space, so I tend to mix things on top of the stove. I turned to set the dirty dishes in the sink, and when I turned back, the batter had already started to puff up. I spooned it into the tins as fast as I could, and each of the dozen wells was full to the top. The muffins were slightly small, but they turned out great. *I spotted Greek yogurt made from coconut milk at the store, maybe that would give it even more coconut punch! *Next time: I’ll toast the interior coconut first, and add lime zest. *I doubled the recipe and got smallish but perfect sized muffins. Thanks so much for all your amazing recipes Deb! SmittenKitchen is a STAPLE go to in our home. I made these (well, slightly adapted) last night, and it was a rousing success. Only had AP flour and refined coconut oil (and no shredded coconut) on hand, but I followed the recipe otherwise for the main ingredients. I substituted a pint of fresh blueberries for the coconut and baked it in a loaf pan because I am lazy. It was delicious, and dare I say, even more moist this morning after spending the night in plastic wrap. Yum! Wow! First thing I baked in a new apartment, and it smells delicious. The Greek yogurt really gives it a nice flavor. I added in boring old raisins and a bit of nutmeg because I love raisins in my muffins and I think nutmeg is just nice. I can’t wait to try this again with some lime. This receipe looks great but I have a question is this for breakfast or dessert? Either way I have to say that I would love to make these and im sure my husband would love to eat them lol. Job well done! I rarely ever comment (I know, I’m bad) but I just HAD to on this one! What an amazing, healthy muffin recipe! My hubby, toddler, and I LOVED them! Even with only putting 1/4 cup of coconut oil in them (read the recipe wrong lol) they turned out wonderfully moist! I also used the fat free plain Greek yogurt from Costco and all white whole-wheat flour! I too was only to squeeze 10 muffins out of the batch so next time I’ll probably double it! They turned out to be approx. 170 calories, 5 grams of protein and 2 grams of fiber!! Not bad for a decadent tasting muffin! These will be in our breakfast rotation for sure now, and I’ll even stick with the 1/4 cup oil! I need to make this immediately. That looks like just about the perfect muffin. Just found this recipe and they’re already in the oven. I can’t wait to taste them. Well, they’re out of the oven and I waited just long enough for them to cool slightly. They are delicious and I know I’ll be making them many times. I’ll have to try some of the variations suggested too. I too don’t comment a lot, but I am a fairly frequent muffin baker, and these may be the most delicious muffins I have ever baked (or eaten)! They are really simple to make, too. I recommend using sea salt or kosher salt for extra-yummy little bursts of flavor. Thank you! Deb: have you given any thought to providing ingredients by weight? I converted the recipe before starting, which, as always, makes the measuring & mixing much simpler. katherine — Yes! It is my dream to get every single recipe up to date with metrics. I myself prefer using the scale. Nevertheless, now I’m doing it on an as-requested basis. I’ve just added the weights here. Feel free to request weights in the comment section of any recipe without it and I’ll add in what I can. Thanks. I made these using low fat plain yogurt, rather than full fat Greek, and they came out pretty flat (but still nice texture and flavor). Is the flatness due to the lack of fat, or because the recipe really doesn’t yield 12 muffins? We just ate two that came out of the oven. We replaced all of the white flour with coconut flour, added the zest of 2 limes and the juice of one lime. The result was delicate, nutty, soft, and delicious. It’s a keeper. Even better than I expected–like a macaroon you can call breakfast! These are so so good. In case anyone is interested in variations: I subbed regular (non Greek) full fat yogurt and unsweetened flaked coconut. I was hoping the extra liquid of the yogurt and the extra dryness of the coconut would balance each other out, and it seemed to work (I also added a little extra baking powder just in case it’d be flat). I mixed them together first thing while I was warming up my coconut oil and mixing dry ingredients thinking that the coconut might absorb some of the liquid of the yogurt. I didn’t add any extra sugar, and I thought they were perfectly off sweet to sweet. This is a keeper! Made these tonight for a vegan friend. Used organic unsweetened shredded coconut. Instead of yogurt, planned on using canned light coconut milk, but ended up using the Blue Diamond Almond/Coconut Milk Blend that I already had in the house. Instead of the egg, used Orgran, No Egg, a powdered vegan egg replacement. Added 1/2 cup of toasted macadamia nuts and a couple of extra tablespoons of unsweetened coconut to make up for the fact that the canned coconut milk would have had a stronger coconut flavor than the Milk Blend I used. They came out beautiful and moist. While I didn’t have all the ingredients this gave me an idea for using the ingredients on hand (looking for a rainy day activity and not wanting to go to the grocery store). No coconut oil – used vegetable. Added 1/4 cup Coco Real Cream of Coconut. No plain Greek yogurt – used Honey Greek yogurt. Decreased sugar and topped half of the muffins with chopped toasted almonda and half with coconut. Thanks for the inspiration and saving a rainy day. THIS is exactly what I’ve been trying to find a recipe for for MONTHS you genius you! Trying to satisfy my coconut baked goods craving with exactly the ingredients I have on hand. I just made these for the second time this week. I had about 6 cups of shredded coconut that I’d dyed pink with beet juice for a cupcake decoration that I changed my mind about, and I’m looking forward to using up the bulk of it with this recipe. They’re so wonderful right out of the oven. Thanks for sharing them! Just made these. This was the first thing I’ve baked in years and they were so easy and delicious. Thanks for the inspiration! First of all, you are my number one trusted food blog. Chickpea pasta hooked me and I’ve come back for a bunch of others. So, I’ve been thinking. It would be SO GREAT if you published menus. When you’re cooking a fancy dinner, or dinner for friends, or just treating yourself to a well-thought meal, what combos do you do? I am severely lacking in creativity when it comes to interesting sides/ drink pairings/desserts that really work with each other and I would love to hear some of your ideas. Hi Kate — Thanks, great idea. I don’t know if I’d do a whole post on it but I definitely want to make an effort to include with dishes what I’d like to eat them with. For example, if I were serving these muffins at a brunch, I might make a mango/papaya/pineapple fruit salad with a lime juice syrup (and maybe a surprise of cayenne). If I were making an egg dish, I might try sweet potato home fries instead of classic ones, or a mix with sweet potatoes. I also love fried plantains (although, no recipe on this site yet for them) and think they’d be great with an egg on top for a breakfast meal, and a side of Canadian bacon. Hope that helps. These – with the addition of chocolate chips – were last night’s dessert. Easily ate 3 in a row without any pangs of guilt. Thanks for a perfectly great recipe. I made these as written tonight, and they are fabulous. I will bring them to my daughter tomorrow morning while she waits for her husband to come out of surgery. Thanks for the recipe that will give her a respite from her pacing. I’m another long time reader who cannot wait for your book! I made these muffins and they were delicious, but was wondering what uses I could find for my remaining coconut oil. This week is National Chocolate Chip Cookie Week (on who’s authority I know not, but so says the interwebs) and typically I use half butter and half shortening. I used coconut oil in lieu of shortening and the results were so delicious. The richness of the oil was so delicious, I was able to omit vanilla extract. I made these and they were a flop. It’s on my because I decided to add chopped pineapple and it affected the ratio of liquid/dry. They smelled heavenly but they oozed coconut oil and the taste of the dough just did not match the things you imagined when you first smelled them. I am gluten intolerant so substituted the flours with 3/4 cups of Pamela’s baking mix and /2 cup of white rice flour. The muffins turned out delicious, light, and fluffy. OOPS The previous post shoudl read half a cup of white rice flour. I made these today. Heavenly, and easy to boot. Cant wait for the Smitten Kitchen cookbook. I made these muffins yesterday and they turned out great! I could make 6 of half a recipe, but this might be because the room I needed for the streusel on top (I just cannot have any muffin without streusel). I also found that these muffins don’t really taste like coconut when they are hot, but they do when they cooled. Then the texture is also better. Usually I like my muffins nice and warm, but these should certainly be cooled down. Because you can’t get sweetened shredded coconut in the Netherlands I went with the substitution mentioned in the comments before, using unsweetened shredded coconut and 1/8 cup extra sugar (because I made half a recipe). I think I could use even less sugar, because they are still quite sweet. And a great tip for people that cannot get hold of virgin coconut oil (I refused to pay 10 euro for a jar of 200 ml): use santen (creamed coconut). It is dehydrated ground coconut flesh pressed in a solid block of creamy white stuff and it has an intense coconut flavour. Normally you use it with some water to get coconut cream or milk, but since it has a fat content of about 70 percent, I figured that I might be able to use it as a cheap (only 1 euro for 200 gram) substitute for the virgin coconut oil. It worked really well! these look absolutely delicious and i’m going to try them first thing in the morning! i love coconut and these look less sinful than the barefoot contessa’s coconut cupcakes (w/ cream cheese frosting…they are delicious but quite dense/ heavy). re: virgin coconut oil, i order mine from amazon in a two-pack (brand: nutiva) and it’s about $0.50 / oz…not too bad and convenient. i love using coconut oil. i’ve swapped it for butter in cookies and brownies with amazing results. ok, i baked them this morning. followed the recipe exactly except swapped the yogurt with 1 cup of coconut milk instead. added 1 cup of semi-sweet guittard chips. delicious! thanks for the recipe. my kids loved it and loved helping w/ sprinkling (and sampling) the coconut flakes. I wasn’t sure when I was making these if the measurement for coconut oil was solid or melted but I measured it solid. Muffings were so moist, rich & delicious! Made these for college girls staying weekend with us & they were a big hit. I added semi-sweet chocolate chips which made them even richer, sort of like almond joy cake. I prefer them with afternoon coffee because too rich for breakfast for me. I like the versatility of this recipe and will definitely make them again. I have never been disappointed with Smitten Kitchen recipes – and I have made many of them! I swapped full fat coconut milk for yogurt, and an equal weight of all-purpose flour for whole wheat (this was self-medicating baking – no room for anything healthy here), and I don’t think my coconut oil was the virgin kind. The final product was delicious but the muffins came out really, really oily – like, a greenish oil slick left in the pan when I lifted them out. They seemed even more oily the next day. Anyone else have this problem? Just tried these and added chocolate chips as suggested! Yum! The recipe made 12 muffins for me! Deb, I expected these muffins to be great when I saw this recipe and knew they would be the second I tasted the batter. I’m not kidding, these are some of the best muffins I’ve ever tasted. These are keepers! I used banana instead of yogurt, and subbed white whole wheat flour for regular whole wheat, and whole wheat pastry flour for the all purpose. I don’t think anyone could possibly tell that my light and fluffy muffins are 100% whole wheat! Just made a batch of these yesterday . . . absolutely delicious! Thanks for the recipe! These look divine! I’ve never cooked with coconut oil, but I have used it as a moisturizer. It does leave your skin a little oily, but it absorbs well and you smell great. I have really dry skin and it does wonders… as long as I can keep my dog from licking it off my legs. finally made these this morning. really good…but i only got 5!!!! These were fantastic! I got 12 muffins using a 1/4 cup scoop and regular muffin liners. They will be going on the easter morning breakfast menu for sure. Can’t wait for the cookbook, Deb! I made mine with bananas in place of the yogurt and unsweetened coconut and my husband thought they were really good (I wish I hadn’t finished my yogurt the day before though). I’m also happy I got a good healthy dose of coconut oil for the day. Also, I am glad that you posted that you have ups and downs just like everyone because sometimes I think that your life is all ups (great vacations, awesome food, living in new york city, beautiful son, etc.). Just made these today – Absolutely amazing! they taste sorta like Coconut Cream Pie. I used the coconut milk in them as well. Love Love Love! Thank you for all your wonderful recipes! Just made these and they are delicious! I am a college student and have limited resources so I swapped the coconut oil for natural applesauce (the chunky kind) and I just so happened to have coconut sugar that I replaced the sugar for. I used different variations of flour as well, but they turned out fantastic! They were super moist and their fragrant scent warmed my apartment! I love these muffins. I have now made them 3 times. Today I decided to try making them gluten-free. This was my first attempt at baking using gluten-free powders. Here are the variations I made: I used 1 cup of King Arthur’s new Gluten-free flour and 1/4 cup of Coconut Secret’s Raw Coconut Flour. I used 2 eggs instead of 1. And I used a 6 oz container of Chobani’s Pineapple Greek Yogurt (nonfat). And I added one small mashed banana. 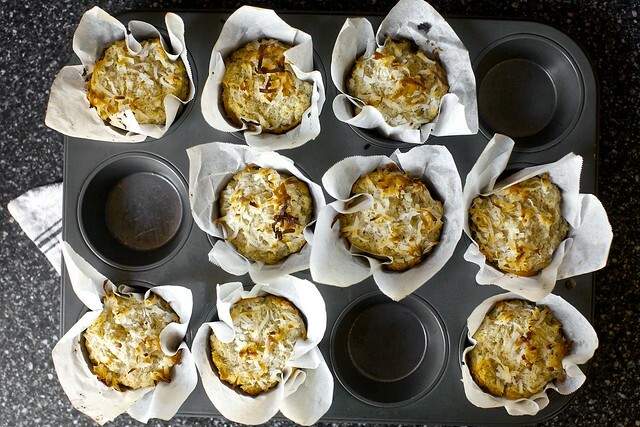 I also used a combination of finely grated coconut and coconut flakes on top of the muffins. They turned out moist, delicious and oh so tropical. Thanks for the fabulous recipe and for inspiring me to experiment! Your beer-cheddar-mustard bread was a great hit around here, and I knew these were winners as well. Thank you for putting fun, spice and flavor into my dreary Groundhog Day life! Love this recipe! I made the coconut version the first time around. Today, I decided to change it up a bit and used mashed banana in place of the greek yogurt as suggested since I didn’t have any yogurt on hand. I also added in apple chunks and walnuts. I also didn’t use wheat flour because I only have white in my kitchen. Still, the muffins came out fantastic! Excellent. Can’t wait to try out another variation! I got in a fight with my boyfriend about the health benefits of coconut oil tonight. He is still following guidelines from some 1990’s self-health book and won’t give it up. He went to be bed, I stayed up. Double coconut muffins are now in the oven. Passive agreesive baking at its best. Thanks for always being there for a girl! I finally made these with full-fat Greek yogourt (only had non-fat last time) and what a difference! They were good before, but very dense in comparison and not nearly as moist. I made some with both mango and chocolate too (1 cup of each) and they are very good and very filling – and, with all the additions, yielded 12 muffins. I’ll try mango and crystallized ginger next time. I first made these just as the recipe directed and they were wonderful! A few days ago I wanted them again, and the only yogurt I had was peach Chobani, so I used that and tossed in a diced up yellow mango. They were fabulous! The peach flavor was very subtle, but still there a little, and the mangos were a great addition. Btoh flavors worked beautifully with the coconut. Thanks for a new favorite recipe, with many more modifications yet to be tested! Delicious! Like Michelle (commenter 340) mine also came out oily. The residue wasn’t green but there was a nice layer, not film but layer, of oil left in my muffin tins and the muffin liners are pretty oily as well. Any idea of why that would happen? Of course it isn’t stop me from devouring them! Wonderful muffins – they taste like CAKE! I used half all-purpose and half white whole wheat flour, 2% Greek yogurt, and I only had unsweetened coconut, so I increased the sugar to 1/2 cup. Also, baked them in mini muffin tins without liners. Hi Deb! I made this with a couple tweaks that worked well. Didn’t read all the comments, but I saw a bunch of notes about coconut flour, so I wanted everyone to know that you can swap in some and they still turn out delish! I actually used 3/4 cup 50/50 proof flour and then 1/2 cup of coconut flour. I then needed to add a 1/2 cup of milk since the coconut flour absorbs so much liquid. They turned out the perfect consistency – still moist, and you couldn’t even tell that it had been swapped in, except for an increased coconut flavor. I actually used unsweetened shredded coconut as well without adjusting the sugar content, and it was still great! So if anyone’s looking to decrease the sugar, it doesn’t hurt the muffin at all. I didn’t have Greek yogurt so I subbed regular full fat plain yogurt from a local creamery and it was great, but I think the Greek yogurt might have made it even more dense (i love me a dense muffin!). Thanks for the recipe! These are Ahhhhmazing! We are gluten & wheat free in our home and I made these by substituting brown rice flour ( instead of plain all purpose ) & 1/2 almond meal 1/2 amaranth flour ( instead of whole wheat ). I used coconut butter instead too as I had it in the larder and it worked a treat! I love. Kids love. Thanks for the inspiration! I made these this morning for breakfast. My mom really liked them. And my litte brother liked them too. I thought they were AMAZING!!!! I just made these and gobbled up two. They are so so so good. The coconut oil is a revelation. Thank you for another wonderful recipe. I loved this recipe! I’ll most definitely try it out… Thanks so much for this idea!! I’m so sorry… i missed spelled my link, sorry about it! I (finally) made a Paleo version of these! I used almond flour and coconut flour instead of all purpose or whole wheat, honey instead of sugar, omitted the dairy. Came out just great! Check it out at grokgrub.wordpress.com if you’re interested. This was the first recipe of yours that I made and it turned out beautifully, thank you for all of the extra info and the beautiful photos. I appreciate that you have the measurements in metric, too – I’m a U.S. expat living in Europe and it’s maddening when trying to convert recipes. Onto your next recipe I go! Just made these and they are very good. I was dubious when I saw how little sugar they used, and then that good-for-you whole wheat flour (I do not have a problem with cake for breakfast… :)) … but they are delicious! I threw in chocolate chips, and had to use non-fat Greek yogurt b/c that’s what I have around (I didn’t have quite enough, so I topped it off with heavy whipping cream), but other than that I followed the recipe exactly. The texture is really good, but I’m surprised that the coconut flavor didn’t knock me out – it was subtle. 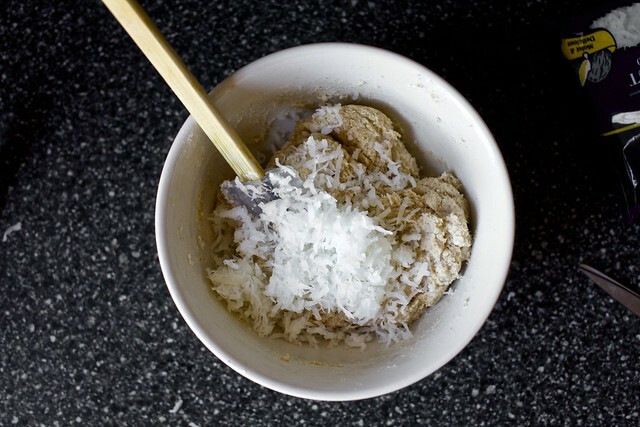 On this coconut note, have you tried the big (unsweetened) coconut flakes yet? A friend got them for me at My Organic Market (MOM’s) here in the DC area, and they are ROCKING in granola, and give you a good coconut bang for your buck. Love the earlier comment asking you to suggest menus! whoops, just saw it’s actually not in German, it’s just the British version. Do you use the metric system in the American version? I’ve made these twice now, the first time I thought they were tasty, but heavier and oilier than I desired (horrors! ), also I used unsweetened coconut shreds in place of the sweetened. I made them again this morning, my best success to date at altering a baking recipe. I turned these into Coconut Pumpkin Muffins in this manner, I changed the recipe as follows: cut coconut oil back to 1/4 c., replaced all-purpose flour with whole wheat pastry flour, and replaced whole wheat flour with all-purpose flour, added 1 tbs. coconut nectar sugar, replaced low-fat Greek yogurt with 1/2 pumpkin puree and 1/2 c. whole milk plain yogurt. Also, I used unsweetened shredded coconut instead of sweetened. I would make this way again, except use 1/3 c. total sugars, 1/2 coconut nectar sugar, 1/2 organic cane sugar. Delicious! Lighter than original recipe, and slightly pumpkiny. Also, I had your book on pre-order at Amazon.com, and am still waiting for that lovely moment when the children are both resting and I am awake enough to enjoy reading through it carefully. I really appreciate your less-than-others sugar amounts in recipes, I especially like your mom’s *bleep* cake, both versions, and last week my kid ate your quiche recipe (Ken Haedrich’s Extra-Flaky Crust recipe, with palm shortening) (with double the spinach plus a bit more milk) like he’d been waiting his whole life for it. (All 2.5 years of it.) Thanks for the tasty recipes and entertaining writing. Lately I’ve had to avoid certain blogs where they’re discussing your great book because I’m afraid I’ll read a spoiler (like, book spoiler alert to follow: apparently there’s some great toffee in there.) Thanks again. I also just made these (doubling the recipe) and found my muffins a bit on the oily side so next time i’ll cut back on the coconut oil. I added the zest and juice of one lemon and it added a really yummy, subtle and fresh spin to the muffins! They were extremely moist and “springy”! I will def be making these again, and next time i’m going to attempt at making them gluten free for my sisters in law. I had some coconut milk that I wanted to use up, so I made these this morning. I modified the recipe based on what I had readily available in my kitchen. I used only AP flour (1-1/4 C), 3/4 C light coconut milk + 1/4 C fat-free honey-flavoured Greek yogurt, and of course, I had to add 1 C chocolate chips (which is a LOT of chocolate, but the perfect amount for me!). The result: 12 delicious, fluffy, perfectly-sized, triple-coconut choc-chip muffins! And the chocolate definitely sends them from muffin-land to cupcake-heaven! I just made these and they are amazing!! So creamy and not too sweet. Thank you!! I’ve now made these twice over the last week and our family of five loves them. I only had unsweetened fine coconut and it worked great. I added 1/2 cup of chocolate chips each time and I think if I had sweetened coconut it would have been too sweet. This is the first time I’ve cooked with coconut oil, despite having a tub of it in my fridge for over a year. I’m going to try really hard to slow down on making them as I don’t want to get tired of them. Also, I feel like these are more like cupcakes than muffins, maybe because they’re so moist and fluffy. They are perfect. Thank you! Love this recipe! Have made them three times three ways and they’ve all been great. Made two gluten-free batches and one regular: I added chocolate chips to the regular batch and the people in my office went crazy for them; I used Cup4Cup flour in both gluten-free batches, with oat flour in one batch and hazelnut flour in the other. Hazelnut was the winner— soooooooo yummy! Of note: all three of my batches needed 25-35 mins baking time. I have an oven thermometer, so not sure what that’s about! Thanks for another great recipe, Deb! I’ve always enjoyed cooking and baking but honestly Smitten Kitchen has taken my kitchen fruitions to a whole other level! i just made these and they came out very oily and bland. maybe less oil and more sugar? I’ve read every comment and my mouth was watering for these. I followed the directions exactly and have to admit I was disappointed. Mine turned out dense, which was fine, but NOT that coconut-ty. I wonder if the yogurt was too tart, as Deb talked about. I will try them once more with coconut milk instead of yoghurt and maybe some pineapple. Did anyone else have this problem? I SO want to love these!! @salsasue Are you sure you aren’t over-mixing your ingredients? I made these for the first time tonight and they were perfect…try using a spatula to gently fold the wet and dry together. If you over-stir that can cause denseness. However, if you live at high altitude that may also be part of it. I agree, though, the coconut flavor was extremely subtle. I made these over the weekend, and they were absolutely delicious – so coconutty and moist and not too sweet. Thank you! These turned out so moist and perfect! I substituted Trader Joe’s gluten free flour and xilitol for sugar and added a few berries. SO AMAZING. My son ate two of them! I’m working on a big brunch plan for next weekend and made these today for practice. I did end up with 12 – but I must have made them smaller than yours because they cooked up in 17 minutes. So so yummy. THANK YOU! Would you fix the recipe so that the ingredient list includes “the egg” mentioned in the directions? Every time I make this recipe it messes me up that it’s not in there. Thanks. I turn these into pumpkin coconut muffins by replacing 1/2 of the yogurt (whole milk regular) with puree. This morning they’ll actually be Carnival squash coconut muffins. Thanks! Whooops! Guess my eyes somehow weren’t seeing the egg in it! Now why would my brain do that to me? Sorry! But repeatedly? I assume 1 egg? Looking good so far! I used thinned out coconut cream (extra thick coconut milk, not the sweetened stuff) in place of yogurt and they turned out wonderfully! I’ve become a better cook because of this site, so thank you! Thank you, thank you, thank you for all of your cooking, baking, mentoring, describing, explaining, laughing, scheming, and writing. I love reading your posts and seeing your photos! I was introduced to your blog 18 months ago and I have made several of your recipes (as well as read dozens and dozens more). Hi Emily — Thank you! I made these again (for the 4th or 5th time) and used half yogurt-half coconut milk. I was out of wheat flour, but used sweet potato flour (available sometimes here in Kenya) instead and stirred in a 1/4 cup oatmeal and a banana. I also used unsweetened dessicated coconut (also the only kind you can buy here), but forgot to add any sugar to compensate. It was delicious anyway and sweet enough and I am a sugar fiend. :) Love, love, love these. And my house smells amazing! Would regular muffin cups work, or does it need to be the parchment liners? Having read all nearly 400 reviews, please, I still need to ask; would this work as a cake and with what pan size? I’m fairly new to baking and you have practically held my hand all thru my baking endeavors. Last night I made a banana cake using ur mom”s apple cake recipe bcos am lactose intolerant. Hubby has only been home less than an hour but half the cake is gone! I wish to make ds as a 10inch coconut cake for 2 of my colleagues birthdays’ next week. Could you help me out please? I could only trust ur directions Deb! AFMC — I haven’t tried it as a cake but I suspect it might work as something like a quickbread in a loaf pan. You also might like this coconut cake intended as a loaf. My only problem – I had unsweetened coconut only, no full-fat Greek yogurt, and wanted to make mini muffins – so I Jerry-rigged the recipe to fit! – Sift the dry ingredients (baking powder, salt, flours + extra 1/4 c., and 1/2 c. sugar) into a large mixing bowl. Add the wet mixture from the saucepan. Thanks for your fabulous site and great recipes! I made these for Easter brunch and accidentally used the other kind of coconut oil? Non-virgin coconut oil (would we call that mother-of-many coconut oil)? It was tasty-licious none the less.I added a half-bag of chocolate chips and I felt that really made the muffins. They served as a beautiful sweet accent to everything and hey, maybe Jim Gaffigan is right that muffins are just bald cupcakes, but the world needs more in the way of hoemmade breakfast cupcakes IMHO. I just made these today and they were fabulous! Made a bunch of changes…using miniature muffin tins, I baked them for about nine minutes, subbed half the yogurt for sour cream (didn’t have enough yogurt), and used unsweetened coconut flakes (the large kind, which were all I had). Added a bit more sugar, as another commenter suggested for unsweetened coconut, and they are fabulous! They go well with hot tea. :) Wish I had some lime curd to top them with. LOVED them! It was a hit with all 4 of us. Thanks! YUM! We used vanilla yogurt this time and added blueberries. So good! I’m happy I doubled it. Oh my Lord-I am an avid muffin/quick bread baker using recipes from my mom, cookbooks, tv, food magazines, and blogs and have to say these are the best muffins I have ever made. I usually follow my baking recipes exactly but due to high fat/ calorie content in the coconut oil I made these with 0% Greek yogurt. They are so light and moist it is unbelievable! I am now smitten with you!!! P.S. Your recipe convinced me to buy and use virgin coconut oil for the first time. I am now a believer. Your reference to the fabulous Melissa Clark’s article explaining that it is not as evil as we once perceived did the trick. I am loving her olive oil granola too-now I want to try her coconut version. In case you were wondering, trader joes now makes a coconut creme greek yogurt. I think I’m going to sub that for the regular greek yogurt (dialing back the sugar) and make some cocoloco muffins. My whole family and my boyfriend is crazy for coconut, so I think these are a must. I recently stumbled upon your blog and so this was first ever Smitten Kitchen recipe. The muffins turned out FABULOUS! Nice and light with a lovely flavor. I took your suggestion about the pineapple and I think that was what really “made” the muffins for me. I also substituted almond milk for the yogurt and used unsweetened coconut without any added sugar. I tested them and loved them, thank you so much!! Hi, just a little public service announcement…I made this muffin batter, and Deb’s hot fudge sauce(left off the peppermint, halved the amount of cream). I froze tablespoonfuls of the hot fudge sauce and inserted them into the center of the muffin batter before baking. The batter is thick so to cover the chocolate ball, I put batter on the bottom, then chocolate, then batter to cover. Coconut muffins with chocolate lava hearts? Amazing. Also, I felt like they were even better the next day. How many bananas do you substitute for the yogurt? I tasted these with bananas and they were great. I want to try the recipe now. Thanks so much for your recipes. Beth — Bananas range a lot in size. It’s often between 2 to 3 for 1 cup. How many eggs? Just went to this recipe from your newsletter (love the newsletter format, by the way) and noticed that although the recipe says to add egg with the yogurt, I couldn’t find eggs in the ingredient list. Can’t wait to try these. Will probably make mini-muffins. Ok now I’m officially drooling on my keyboard! Frantzie — The egg is whisked with sugar, coconut oil and yogurt. I made these as written – except for unsweetened coconut and non-fat Greek yogurt (what I had on hand). And I added chocolate chips. Because of course. They were so delicious!!! My husband enjoyed them as well! I’m going to try pineapple next time, and see if I can alter the recipe to make 12 full size muffins, rather than 12 small-ish muffins. Thanks, Deb! You’re getting me out of a baking/cooking funk! I’m so grateful for the blog/Instagram posts and emails for constant inspiration!!!!! There are so many comments so if I’m repeating what someone has already written , please forgive (stopped reading after abt 50). Coconut blossom Sugar is used alot here (holland) lately. If you use you could call them? Treble coconut muffins. Will definitely make these…. they look delicious. I ended up not having enough coconut oil, so I finished it off (by weight, not volume) with ghee. They were delicious!! The ghee gave it a buttery rich flavor that complemented the muffins nicely. I used coconut milk instead of yogurt (the weight was almost exactly the same as yogurt – within a few grams), and unsweetened flakes (because that’s all I had – I compensated by upping the amount of sugar just barely, but I think it would’ve been fine as written). I also had bittersweet chocolate chips. Delicious! I made these yesterday and loved them so much I made them again today. Oops. Incredible flavor and perfectly moist… I added the zest and juice of two lines because I like to put the lime in the coconut. Thanks for another winner! Why not brown sugar? I made these today and feel like they would have been better with brown sugar. Maybe I’ll try again, but I’m just curious why you chose white sugar. Thanks Deb! I just made these today following everything in the recipe above and made 10 muffins. I think with some additions like pineapple or mango it would probably make 12 muffins. I also only baked it at 350 for 18 minutes and the muffins were done and the coconut on top had started to burn a bit so watch out for that. I usually only keep non-fat Greek yogurt on hand but I went and bought some full-fate Greek yogurt and it is much creamier and richer so I would say it is better to use Greek yogurt with some fat. The Greek yogurt whisked beautifully into the egg and sugar. yum (again!) – did muffins last time – this time used all mashed bananas instead of yogurt, white whole wheat flour, and it made 7 mini loaves (25-30 minutes). my new go to when i have a bunch of overripe bananas (and a drizzly day in l.a.) – thanks deb! I made these with one cup of drained, crushed pineapple. With that addition, the recipe made 15 standard muffins. They baked more quickly than I expected, about 13 minutes. They were very moist. I liked the change from typical flavors like blueberry. Next time I might add some lime zest like other commenters did, just to give it a little more zip. That’s wild that they cooked more quickly with an extra cup of pineapple! I wouldn’t have expected that. YUM! I made these yesterday with a few subs to make them dairy-free/egg-free. Flax egg in place of egg, Pureed bananas for the yogurt. 3/4 cup spelt (because I didn’t have WW). And unsweetened coconut. 12 muffins for me. I’m not usually a huge muffin fan, but I loved these. Not too sweet and the crumb was perfect. And I also appreciate that they are flexible! Hi Deb! I just made these with banana and they were delicious. I’m wondering if I can double this recipe without any issue. I’ve read that baking soda can come into play in somehow ruining the finished product. Is this true? Shouldn’t be an issue here at all. They turned out slightly bitter?? How would you adjust these if you wanted to coconut flour? Do you mean a full swap or just partial? In general, partial swaps with fine meals (almond flour, coconut flour) almost always work but to do a full swap, you might find more density/less tenderness. Still won’t taste bad, but definitely texturally different. Coconut flour is a reeeeaaallly different flour. It absorbs tons of moisture and usually requires double or triple the eggs, and definitely yields a much different texture. It’s not a 1:1 swap at all. I personally think it’s a good idea to familiarize yourself with coconut flour first, by finding recipes specifically formulated for that flour. They’re usually structure pretty different from other baked goods recipes. My elderly dad loved these! He will always compliment a meal after it is over, but if he mentions it’s good during the meal, you know you’ve done good. He mentioned these twice and asked if there were more for the next morning. We have a hard time getting him to eat enough sometimes, so thanks for this recipe! I made these for a staff meeting on Thursday & they were delicious! i used the Trader Joe’s full cream yogurt & I couldn’t have asked for better results. When they didn’t all get consumed at the meeting I threw the rest in the freezer & they keep up their integrity in the freezer as well. Thanks for a great recipe! Perhaps there’s something wrong with my oven OR I shouldn’t have attempted a double batch (all in the hot box at once). I have delicious flavor and textured double coconut muffins with BURNT bottoms. Was it the coconut oil? Anyone else? Hi Deb, do you think this would work with fat free yogurt (like Fage)? Also, I forgot to mention I subbed oat flour for the white flour as well, which worked perfectly. Hi! Would it be ok to only use All-Purpose flour? Besides adding 1/4 tsp of coconut extract, I followed the recipe. However, they turned out dense and a bit dry for me (despite puffing up nicely in the oven), with very little coconut flavour. I was gentle with the batter; perhaps I overbaked them? They tasted slightly better the next day. I made them today, following the recipe word by word, and they really turned out very delicious and moist, with a very nice coconut taste. Highly recommended! Picture this: replace sugar with good honey, eliminate 1/4 cup flour and add leftover brown rice (in my case; could be quinoa or buckwheat), switch coconut to unsweetened, and increase the egg to two — and you will have the beautiful, moist, dozen muffins I turned out this morning. I much prefer a more savory less-cakelike muffin which feels nourishing as a breakfast and which I can feed to my 6-year-old with ease, and these were perfect. Mm! Disappointing, even toasted and slathered with citrus-cardamom butter (which I’d made in an attempt to rescue this batch). No real coconut flavour and not a great texture. Wondering whether rehydrating the dried coconut in coconut milk would amp up flavour? Or by that point should you just use fresh?? I just finished making these. They’re pretty tasty! I substituted sour cream for the yogurt (I’m sure it says something about me that I have one and not the other), coconut flour for the whole wheat flour, and unsweetened coconut. If you use unsweetened coconut, you might want to skip the topping. The coconut turns brown, but it’s a burnt brown instead of a caramelized brown flavor. You could also toss your unsweetened coconut with honey or sugar syrup if you prefer to have a topping without a trip to the store. I thought of it too late for this batch, along with the raspberry jam dollop in the middle. Maybe next time. Thanks for the recipe! I made these today with fresh coconut (because, really, what do you do after you crack open a coconut with your toddler in the middle of a blizzard?). Ended up using the entire coconut, grated, which yielded about two cups after my kid and I were done nibbling. I confess I was pretty imprecise about the whole thing, but used at least a cup of coconut in the batter, and then the rest, mixed with a little sugar, sprinkled on the tops. We ended up with 12 muffins. Other modifications: substituted butter for the coconut oil; upped the sugar to a heaping 1/2 cup; and threw in some wheat bran as my whole wheat flour has seen better days. Baked for around 28 minutes till the tops got nice and toasty brown. They were fabulous! These were a big hit in our coconut-loving cabin! Made with hemp milk instead of yogurt, and got 12 small muffins out of it (so I can feel totally not-guilty eating two at a time!). Worked well with dried unsweetened coconut and the suggested bonus 1/4 cup of sugar. Added a teaspoon of cinnamon, and would love to try these with some candied ginger tossed in next time. Could you make these with coconut flour? I doubled the recipe (because who doesn’t like extra muffins??!) and added some lime zest and pineapple chunks, as suggested. They were TERRIBLE- greasy and weird, flavorless, caved in, undercooked even at 30 minutes+ of baking time. 1) I didn’t have ave any regular coconut oil, only the triple refined kind (that doesn’t taste like coconut). Since it lacked coconut flavor, the muffins did as well. My bad. i Should have known not to Use a neutral tasting oil. 2) pineapple! I forgot! It breaks down proteins and doesn’t craaaaa-zzzy things to recipes sometimes. Especially ones that involve large amounts of high protein Greek yogurt. I might try these again, correcting for my earlier mistakes. I just made these muffins exactly as the recipe instructed. They are amazing!! The ease of a muffin, but the flavor and texture are such a departure from the average muffin!! My husband and I are currently helping ourselves to thirds even though we just finished dinner. I might add mango next time, just to see how amazing these can get. Made these the other day. Used all white flour as I had no whole wheat. Turned out super tasty – just enough coconut flavor, not overwhelming. Froze leftovers after a day and they have held their texture/flavor perfectly from the freezer. Also, word to the wise, double-delicious toasted slightly and spread w/ nutella. I have made these twice in the past two weeks. The first time, I made it exactly as the recipe called for…and they were delicious! The second time, I was running low on Greek yogurt, so I did half a cup of yogurt and half a cup of mashed banana. Again, delicious! Both times the recipe yielded 10 muffins (although two of the muffins were rather small, so I can easily see how this would yield 9 muffins). I’m looking forward to continuing to tweak the recipe in a variety of ways. Thank you for this recipe! I’m sad to say that this is the first recipe EVER that did not work for me from this blog. I followed the recipe to the T – no subs, no tweaks that is really a new recipe. They were leaden and flavorless. I generally do not the like the texture of fat free baked goods, but assumed the coconut oil would cover that. My bad. Oh well, onto other recipes – this is definitely not a keeper. Made these this morning; used white whole wheat flour for the whole wheat, and used Ellenos lemon curd Greek yogurt. Otherwise followed the recipe exactly. The dough was very thick at the end and I had to work to get all the dry ingredients incorporated. But, despite that this recipe made 12 perfect muffins for me! The sweetened coconut on top got crispy and wonderful. A nice change from the coconut loaf that I often make. Thanks, SK! I haven’t but it could work. Or you could make this coconut bread! I have made chocolate muffins where I replace part of the flour for black beans. They are delicious and it is a way to make them healthier for my son. Do you have any ideas how to do this recipe healthier? I guess it depends on what you mean by healthier. Are you trying to reduce the sugar? The flour? Or fat? These were great. Instead of 1 cup of Greek yogurt, I substituted 3/4 cup coconut milk and 1/4 cup mashed bananas. I made 3 variations. One plain, one with chocolate chips and one with mango. They were all great but I think the mango was my favorite. I love your recipes <3 So easy to substitute and still consistently delicious. I made this tonight with only rice flour, added mango, and lime zest. Best muffins I've ever had! Excited to make these as a less predictable muffin option! If I want to use the unsweetened coconut I have on hand, how much sugar should I add to compensate? Can I do less sugar and/or coconut sugar if I want something less sweet / with less refined sugar? Thank you! I’m so excited to make these for my son’s upcoming birthday brunch because they’re a less predictable option! If swapping unsweetened coconut because that’s what I have on hand, how much sugar should I add? And can I do coconut sugar and/or less sugar overall with the toddlers in mind? Thanks! oouuuuch,, how to make that double coconut muffins looks so pretty? I have some coconut flour and was curious as to how I might use it in this recipe. Susbstitute for the whole wheat? Or use ¼ C whole wheat and ¼ C coconut flour? This anti-coconut baker saw these and decided make these for the husband. I’m now a coconut devote. I love the texture from the shredded coconut. Just enough sweet, just enough coconut, just enough everything. My batch made 12 perfect muffins. Just tried these: my first time ever baking with coconut oil, and they are certainly moist, but didn’t rise as much as my usual muffins. I got 10 out of the mix but they’re a little on the stingy side. I dialled back the sugar slightly, and added a half teaspoon of strawberry jam in the centres. Will definitely try these again but might fiddle with amounts to produce a larger batch that makes a dozen. Hi Deb, I love your recipes! And I’m really excited to make these muffins – hopefully today. My fiance has a very strong dairy intolerance, so I’m curious about substituting coconut milk for the yogurt – as you mentioned. Would it be an equal one for one substitution? Should I use full-fat, canned coconut milk, or can I use the more watery coconut milk I have in my fridge that he uses with his coffee? I have both, but am curious! For yogurt, I’d use full-fat. Hello…thanks for the recipe! I made these as directed and added lime zest and white chocolate chips…yum. They smell heavenly and taste great. I baked them 18 minutes. The batter after mixing seems heavy and a bit stiff, but the muffins are moist and not heavy at all. I did use toasted coconut, and I made a lime syrup with the juice of half a lime, 2 tbsp water, and 1/4 c sugar boiled for a few minutes till syrupy. Then poked holes in hot baked muffins and drizzled about a tsp of syrup over each. They’re really good! I made these tonight and they are pretty mediocre and lackluster. They are pretty bland as written. I added 1/4 tsp of coconut extract to try to help with the flavor, and while I’m sure it helps, these would need a lot of work to taste better. The texture is fine, and they are moist, and they have good rise. They are kind of bready, which isn’t surprising as the batter is very thick. Overall, I’d say they don’t really cut it as every worth making again.